At the end of my trip to Bonaire, I was getting worried about the flights for the rest of the ABC islands segment. Insel Air as I was told had a very poor reliability record. I tried to contact them without success, but when going back to my reservation, I saw that my Sunday flight time had been changed. Without anyone informing me. Not by a few minutes, but by eight hours. This would mean, quite simply that instead of being able to watch two games on Sunday in Curacao, I would arrive midway through the second match. On arriving at the airport, I found desk of Insel Air. What has happened to the morning flight. We cancelled it! Were you intending to tell me? No reply. The flight will not suit me, I want you to change me to another airline! We won’t do that for you. They agreed to an unspecified amount of refund, which I may receive via the travel agent that booked it – sometime next year; but it was down to me to book the earlier flight with another airline. Now I normally search for routes with the search sites, Skyscanner and Kayak – and I wanted to get the flight sorted quickly so I ended up paying £98 for a flight 45 minutes earlier than the cancelled one. By comparison, the Insel Air flight to Aruba worked well. There was a note on the booking about a short amount of time to change planes, as one had to fly from Bonaire to Curacao and then onto Aruba. But as both flights were listed as being on a Fokker F-50, and the airline had only one such plane, one knew the connection would not be missed. I think the airline may in fact have only the one serviceable plane. I saw two larger aircraft in their livery at Curacao airport on this journey, (Thursday). They were still in the same place when I got back (Sunday), and again when I left (Tuesday). Websites such as flight radar 24 only show the Fokker as operating and even sometimes taking on the two hour each way trip to Sint Maarten. That flight should be with one of the larger planes, and seems to be cancelled frequently – making me glad that at least this was not the airline that had brought me to Curacao in the first place. With the same plane running both legs of the journey, and luggage booked through, passengers making the connection stayed on the flight. Curiously I had two boarding cards with different seat allocations and had to switch while the plane was stopped – even though my original seat was not used for the second part of the journey. While waiting for the flight in Bonaire, I ran into Ludwig Balentin again. 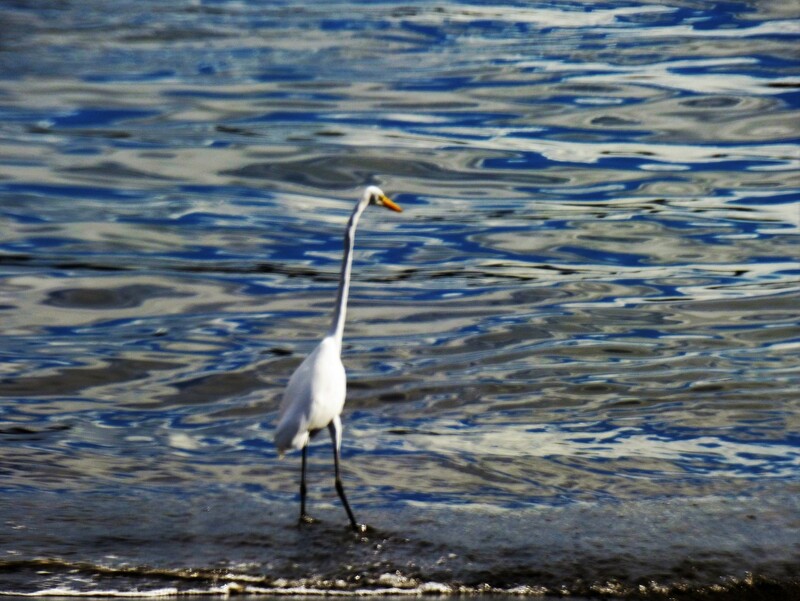 His friend from the night before was now living in Curacao, and had only made a short visit. Apparently his first to the island in 30 years, most of the time spent working in the Netherlands, although he been in England as the company in the Netherlands had a contract during the building of the new Wembley Stadium. On arrival, it was a taxi to transfer to the hotel. The taxis from the airport run at fixed price, US$21 for the journey which took about ten minutes. A lot of the accommodation on this trip has been in apartments, as in many of the destinations, the only hotels are either high end with the equivalent rates, or absolute dives with no facilities. By comparison, most of the apartments were quite good and the people running them were friendly and helpful. Prices were the equivalent or higher to the type of mid-range hotel I would normally us in Europe or Asia. In Aruba, I was in a modern and fresh hotel. I believe it had not been open long. The reservation site showed an artist’s impression of the outside, while in a couple of places, including within my room, there were electrical cables hanging from the ceiling waiting for some unknown extra to be fitted. It had most mod cons, and the real advantage of an upstairs communal lounge and veranda with a coffee maker running through day. Surprisingly, it lacked running hot water. The apartments I had stayed already in Curacao and Boaire also lacked this, but I would have thought a modern hotel would have thought to add this. The hotel is at one end of the road known as Caya G. F. Betico Croes. This is far too complicated name, especially in an area which has many visitors just jumping off the cruise ships. Hence a secondary name has been added, Main Street. Betico Croes was a leading politician in Aruba in developing the territory’s route to independence in the 1970s. Main Street itself is wonderful. It is pedestrianised, except for a tramway that runs straight down the middle, and they play a curious mixture of Spanish pop and English Christmas pop and carols over speakers. I am fairly sure the pop music I heard was Spanish, but throughout the ABC Islands, a lot of what I took to be spoken Spanish was actually Papiamento. This is a local creole language with its routes in Spanish and Portuguese. The people in these islands are very polyglot, and the majority speak Papiamento, Spanish, Dutch and English. Although Dutch is the official language of the islands, it is the least used of the four. I rode the tram from the terminal by my hotel down to the end and stayed on back to my start point. It took about an hour. At other times, I walked the route which takes ten minutes each way. The tram is free and runs on batteries, so no unsightly overhead cables. A variety of shops and restaurants are situated on it, and the local bus terminal is at the bottom end. The really high-end shops, casinos and restaurants are closer to the cruise terminal. The island has a second tourist area, for those that want to stay there. The top end of this is called the high-rise hotel zone. Slightly further south is the low-rise hotel zone. I got to the high-rise zone and it was also sanitised for tourists. Guide books however do recommend using the buses to travel between town and hotel, as a cheap alternative to taxis. As I have mentioned in the other reports, the idea of a taxi as a transport that can be used by the average citizen has not caught on in the Caribbean. If a local can afford taxi fares, then s/he can also afford to buy a car. Every island I have been on suffers from traffic jams. Aruba had come under Dutch control in 1636 and remained as such until the 1970s. At the time, the Netherlands included seven territories that are considered Caribbean. This includes Suriname, which like Guyana and French Guyana is on the South American mainland. Only Suriname has actually become fully independent. Aruba official changed its status to being a constituent country of the Netherlands in 1986. This separated it from the rest of the Netherlands Antilles and allowed its own Football Association to become a full member of FIFA, which occurred in 1988. At the time, Aruba was supposedly on the road to full independence, but this was suspended (at Aruba’s request) in 1990. 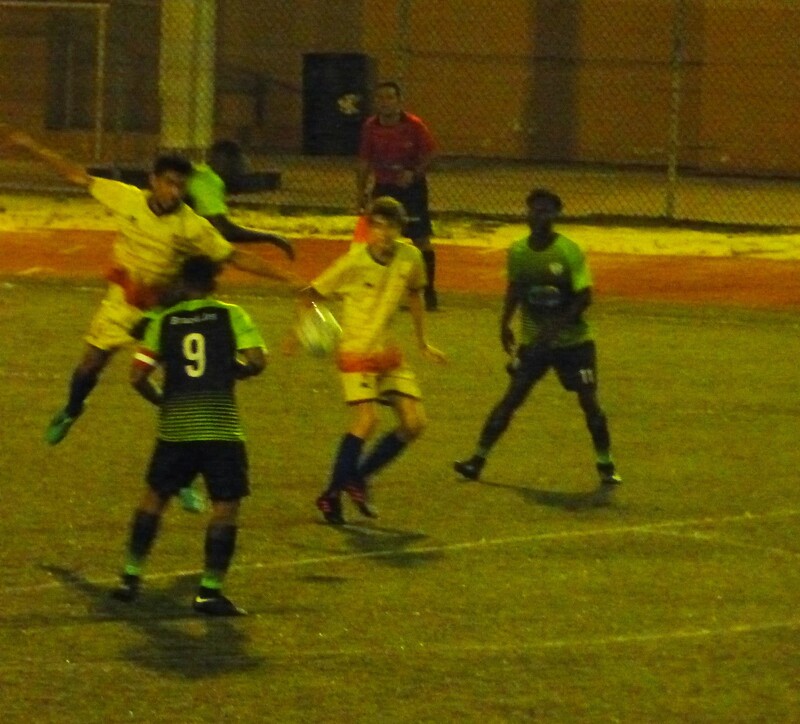 I wanted to get out to the offices of the Aruba Voetbal Bond, and managed this without difficulty. The trip involved catching the number 7 bus from the main bus station and asking to be dropped off at the right point. I easily managed to confirm my fixture plan while there. 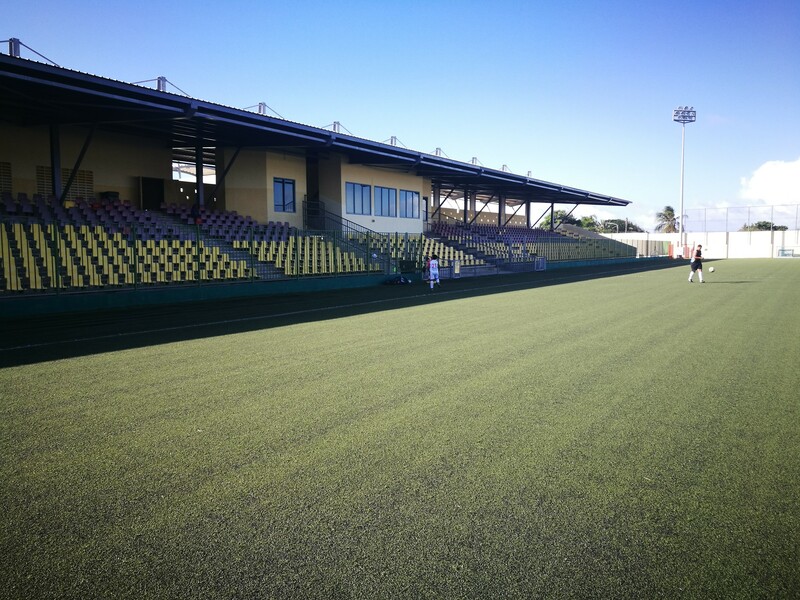 The top division games are played in the main stadium, a conveniently short walk from my hotel, while the lower division is split between the main stadium and the Centro Deportivo Frans Figaroa. I spoke briefly too with the national team coach, Martin Koopman and arranged to meet him again the next day at the top division games. 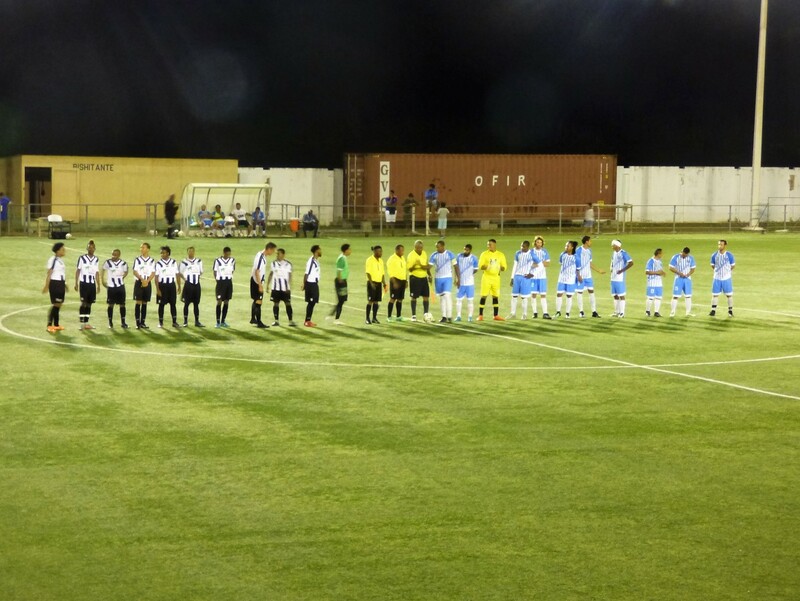 The office was within the Centro Deportivo Frans Figaroa, but there is not a lot there and it was four hours to kick off. My plan was to get down to the high-rise hotel area and find the Fireson Brewery, the island’s only craft outlet. This plan was not difficult in itself, but I managed to fail to be in the right place to stop the service bus as it passed, or a couple of the small minibuses that also supply transport. In the end, I completed the full journey from the stadium on foot, taking about 45 minutes. Much of this was along major roads, but there is always some type of footway, mainly of gravel or small stones. The general appearance of the buildings around was good. As I approached the hotel area, everything gradually became more up-market. Even with the walk, I arrived at my destination just ten minutes after the scheduled opening time and found the building apparently deserted. After a scout around, someone did let me in and told me they were not opening for another 10-15 minutes. I asked if I could wait inside, and could I have a beer while I waited. No problems. That had three beers on tap, a very hoppy unfiltered IPA and two stouts. I tried all three. The only food on offer was Pastechi, the local variant on a pasty. I had a couple of these as well. 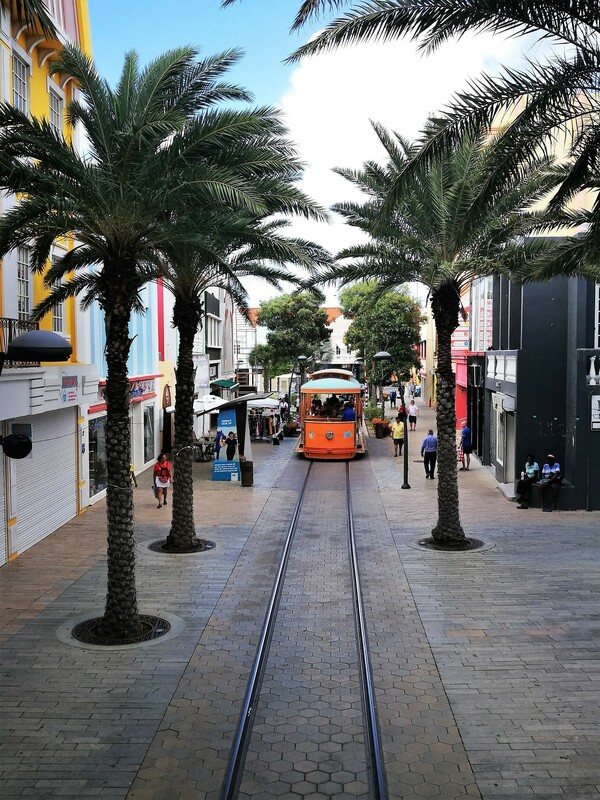 Considering that the main bus schedule is published, but only for departure times from Oranjestad, I managed to work things out well, leaving the bar just before seven and knowing I did not want to walk back as it was now getting dark. 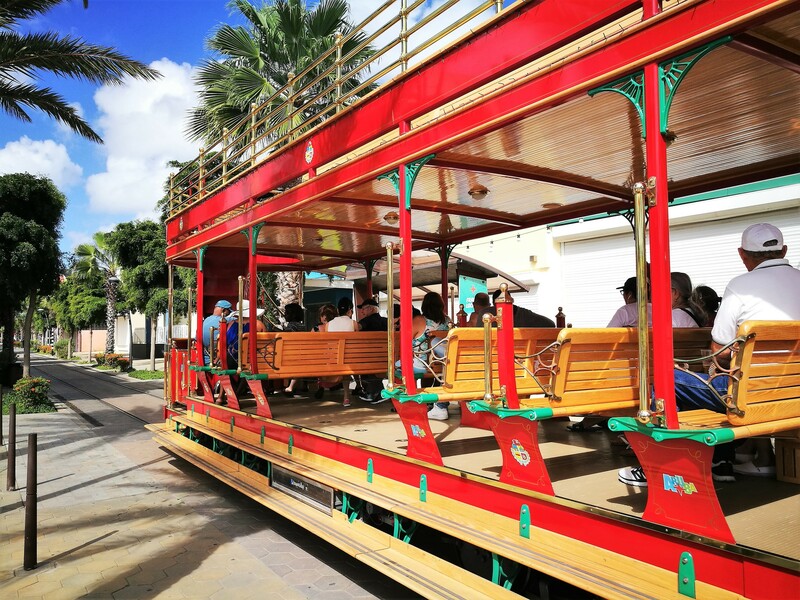 The first bus along was indeed my route, (this is a once and hour service, while the other route to Oranjestad runs every ten minutes). It would of course have helped if the route number or intermediate points were displayed on the front of the bus, rather than just the final destination, but at least the driver was helpful. 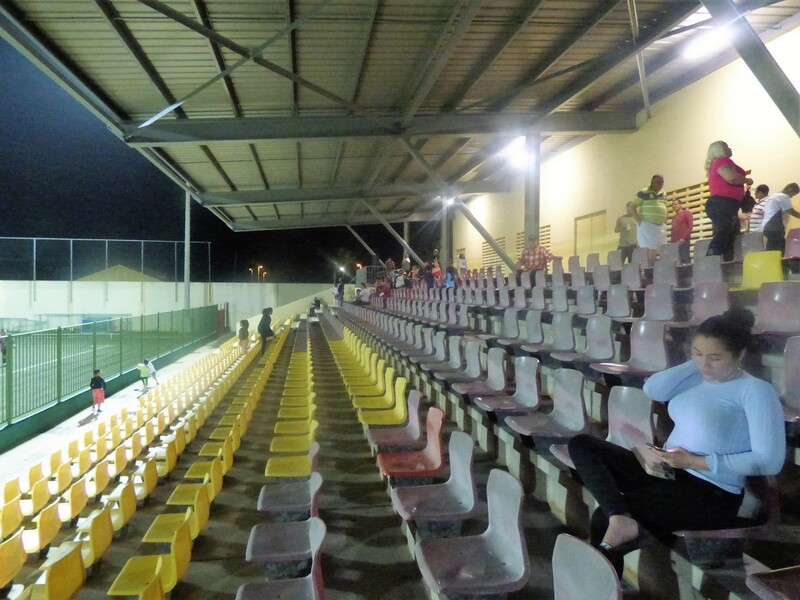 He even told me, as I left the bus that the last run on the route would leave Oranjestad at 9.30, meaning that it would get to the stadium on its return soon after 10, ideal for an 8 o’clock kick off. There is no admission charge, and I have some time to relax before trying to find the team lists. When I drop down to find them, I discover that there is a problem. Not with the teams who are all present and correct, but with the officials. There is a loan, eighteen-year-old official in the dressing rooms. This is Leandre Trimon and he is scheduled as one of the assistant referees. His colleagues for the game are no where to be seen. Trimon tells me that he had taken sole charge of an U-20 game in midweek and it had not gone well, so he was unwilling to take on the task alone. There are a number of urgent phone calls going on and just after the official kick off time, I am told we have secured a replacement referee and we just have to wait for him to get there. 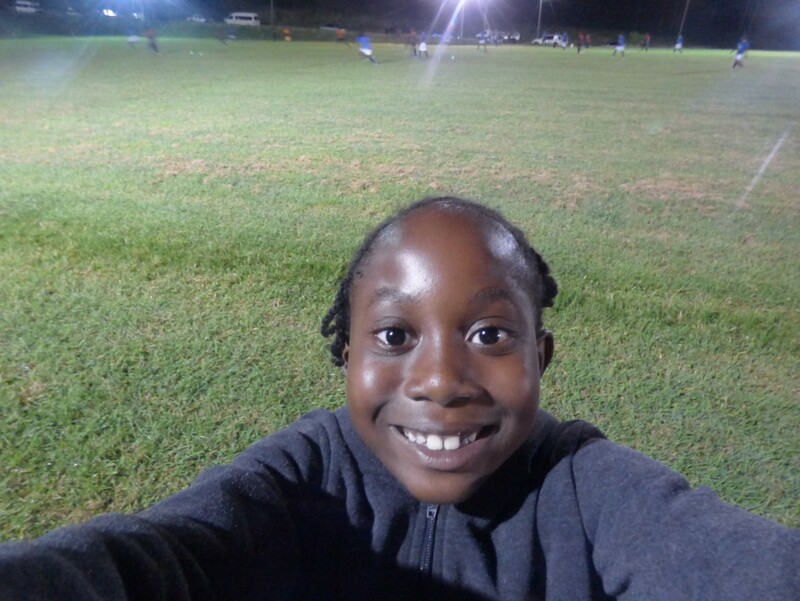 Leandre has been refereeing for two years, and has been to an age group CONCACAF tournament on Curacao. When he got there, all the referees were told they had to be presentable. This apparently means no beards, and certainly no dreadlocks. I am thinking that such discrimination would not be allowed in Europe. My friend shaved off his small beard for the next day. Local referees who did not suffered extra fitness training. Apart from that, he was most concerned with the problem the late kick off would have on his social life. He had a girlfriend to meet later in the evening! He still was happy to agree to help me get away from the stadium when I said I needed help because the delay meant the game would not finish until after the last bus. Our referee turned up, having driven from the main stadium and we kicked off 40 minutes late. Apparently, the replacement, Mr. W. Tromp (I misheard and asked, “as in President”. Certainly not, its with an ‘o’). The stadium is one sided, with the single tier stand having plenty of plastic seats for all. The access pathway is at the top, and there are no refreshment facilities inside the ground. Instead, I went out to the supermarket across the road to stock up at half time. I was not alone in this, and made it back to my seat in good time. I waited outside the dressing rooms while the referee and assistant were tidying up. It seems there is quite a bit of paper work after the game, and the packs of player passports have to be returned to the team coaches. Leandre Trimon quite liked the idea when I mentioned it that in France, Belgium and Germany this is all done on tablets, and that the French FA have provided the tablets so as they are available in Martinique and Guadeloupe. He found it strange to hear that we are lagging behind such technique in England. After the game, he did not shower at the ground, (although when questioned, he said facilities were there). Instead his parents picked us up outside, drove to his house where he quickly showed and changed and then into town where they dropped me off before taking him on to meet his girlfriend outside the cinema. Hope it was a good film. 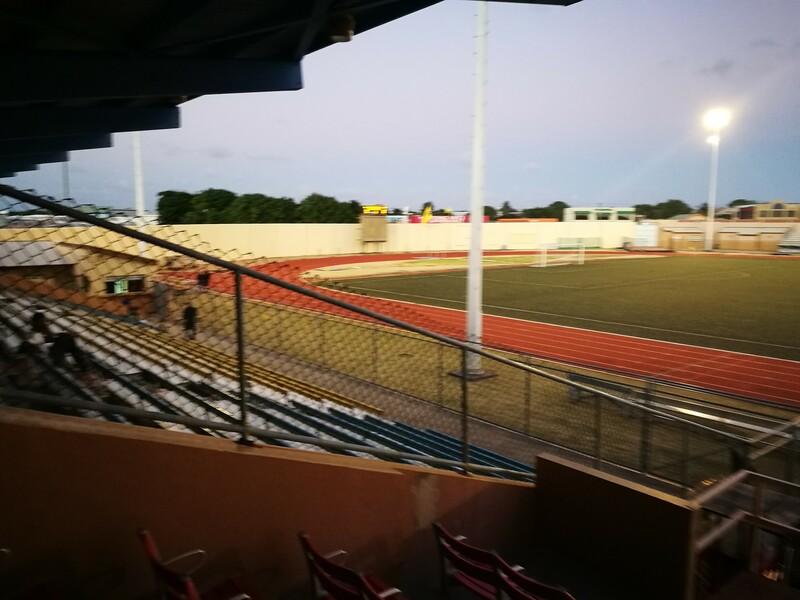 On the Saturday, I meandered around the town without doing anything much, wrote up some of my blog on Bonaire and in the early evening made the walk to the Guillermo Prospero Trinidad Stadion. 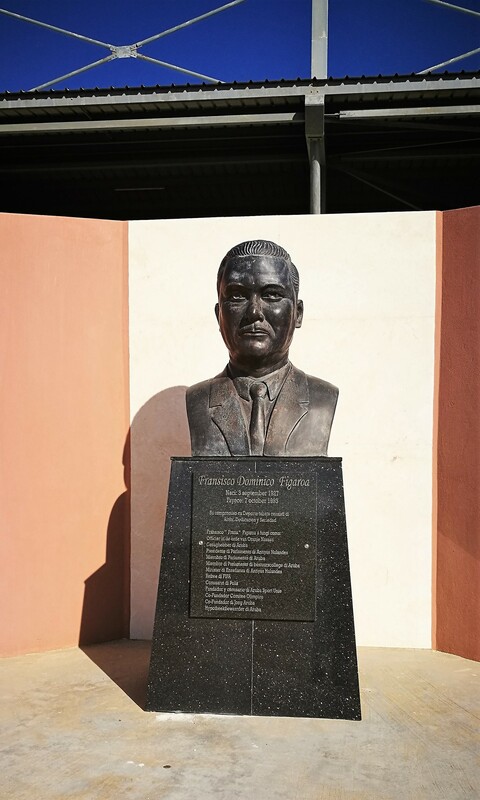 This means that on a trip where I only managed to pass through Trinidad to change flights, I saw football at two grounds named after people called Trinidad. This stadium is two sided, and with a running track. There are no spectator facilities provided behind the goals. 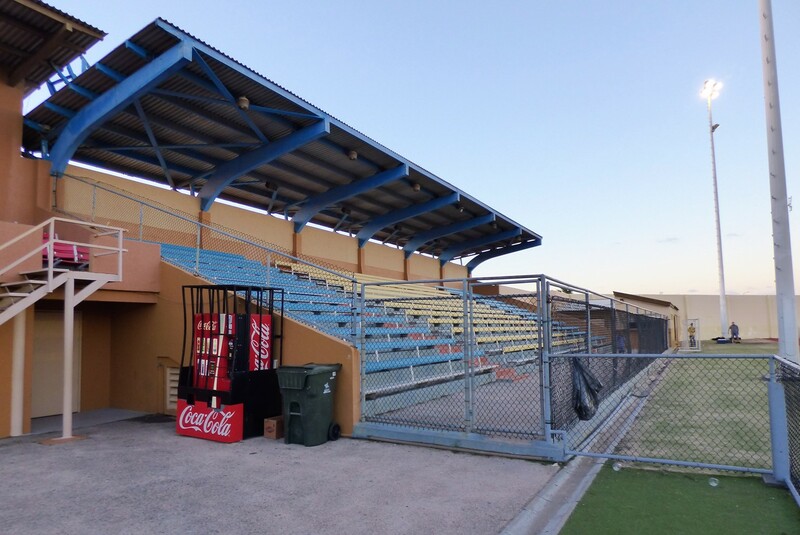 The far side was a single metal stand, with rows of metal seats sitting on scaffolding, while opposite is the older covered stand, in two sections with a large gap in the middle for entry and exit from the ground. There are small number of central seats with the press box behind above this central gap, and thanks to having arranged to meet with Martin Koopman, this is where my (complimentary) position in the ground was. The seating area each side of the centre is on wooden benches. The stand itself is concrete, post war but quite old, while the roof which does not extend over the full area appears newer. There are two games to watch, 6.30 and 8.30 kick offs. The first sees league champions Dakota playing against River Plate, while this is to be followed by Brazil Juniors against Britannia. Some of the names, such as Dakota refer to areas of the island, (the stadium itself is in the Dakota district), but most appear to be chosen because they sound good. Most clubs are based around one or other of the island’s villages. The name Brazil Juniors, I was told was after the Brazil Nut tree rather than the country. The story was that there is a large Brazil Nut tree in the village. Since Aruba is an arid country, while the Brazil Nut tree normally grows in the rain forests of Brazil and Bolivia, I would need confirmation that this was not a tall tale. The league is arranged in a division of ten teams, with five matches every weekend at this single stadium. The top four then go into a play-off, playing another six matches each. As more people watch these, there were no double headers (at least last season). This would increase the income. There is then a final over two legs – with a third match if these go one each way. There is, at least no penalty shoot-out in games one and two, so Dakota won last season’s title after the first game finished goal-less and the second was won 4-2. Deportivo Nacional, were the beaten finalists having finished one point ahead of Dakota in the group of four, but three points behind them in the original ten team league. That means the two teams met eight times in the course of the season. At least they avoided clashing in the Cup. This season, Dakota had lost for the first time a week before I arrived, which meant that Nacional went to the top of the table by winning the Friday game. Dakota therefore needed to win in order to take back the lead (on goal difference). This was not aided by an early goal against, but over the first 70 minutes, their attacking 3-4-3 formation gave them an edge and they deservedly had turned the game around to lead 2-1. At this point, one of the midfielders was sent off for spitting at an opponent. Dakota responded by going into a shell, and dropping back to a 4-4-1 formation after substitutions. There were no shortage of substitutions here. Division Honor teams are allowed four, and Dakota did not hold back. They had changed two at half time, in response to being a goal down, and two more after the card. In the division uno game the night before, five changes were allowed and a total of nine substitutions were made in the game. The lock-down worked and the game finished at 2-1 to Dakota who remained top of the league. 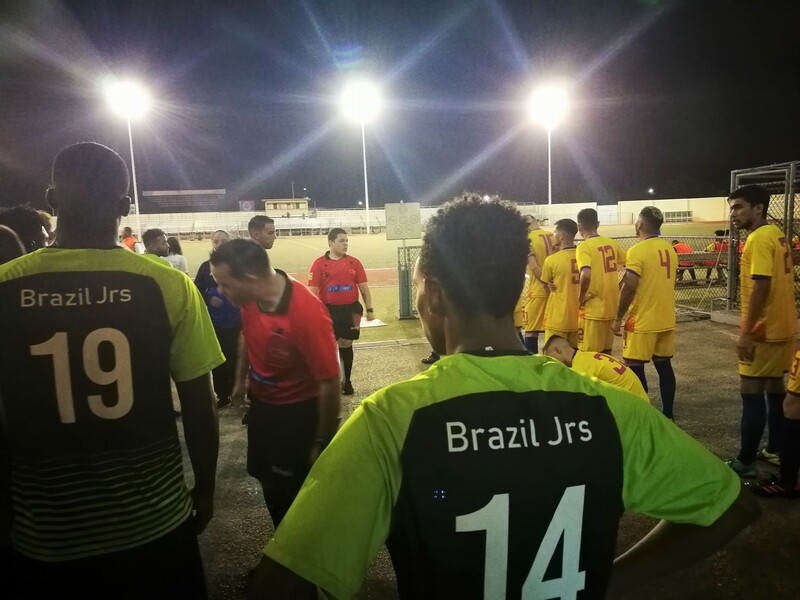 Brazil Juniors were to win the second game. They were promoted from the lower division last season and the talk was that they were doing much better than expected to keep themselves in the top half of the league. I was promised by some that they would have an exciting flourish to them, but in retrospect this was not the case. The game was slightly dour, especially when compared to the earlier entertainment. Britannia, who started (and finished) the weekend in third place were also uninspired. A goal midway through the first half put Brazil ahead and Britannia lost a man (second yellow card) midway through the second. After that, you could not see them getting back into the game. 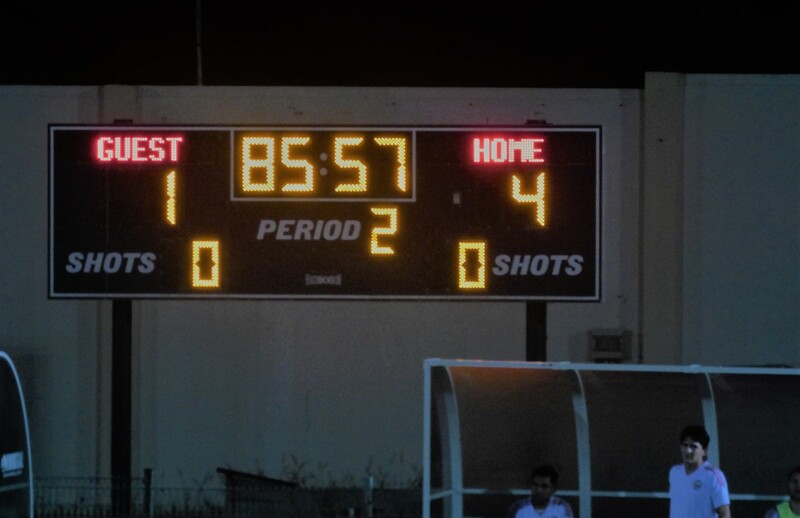 Still it took a penalty a minute before the end to give the Juniors a more comfortable scoreline. I immediately noticed a number of differences, these must to some extent follow each other. Firstly, the climate is different, it is far more humid – but apparently, they also get less rainfall than the other islands. One advantage they have because of this is they are not in “hurricane alley”. The dryness of the islands means that the ground is comparatively arid. 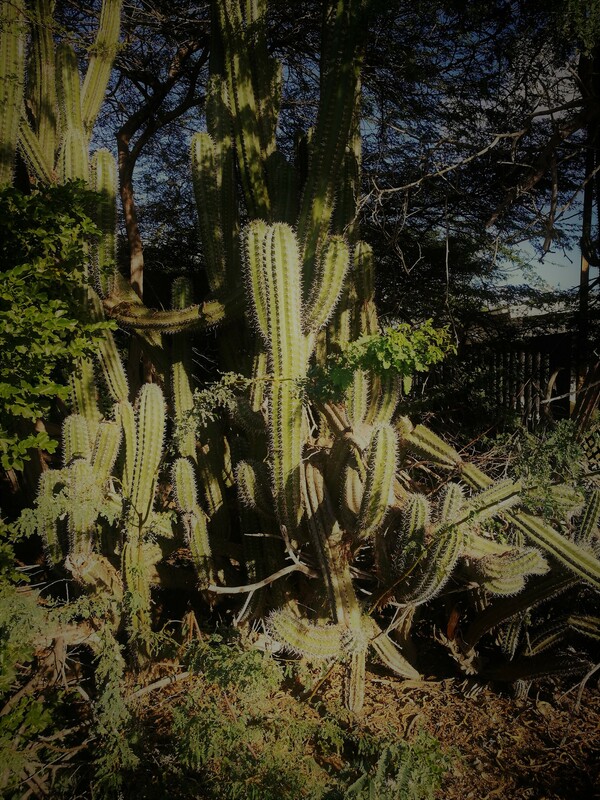 Once you arrive, you cannot help but notice the number of Cacti around. I would think the next bit is a consequence of this. 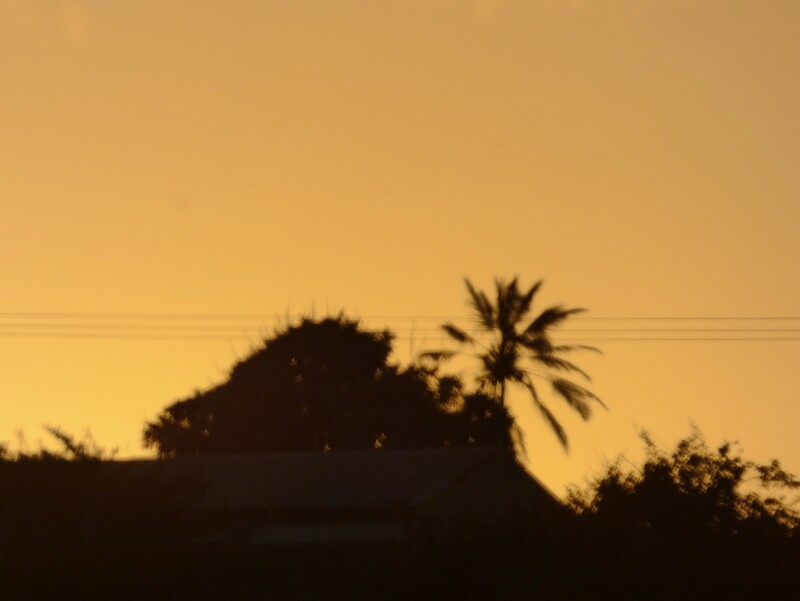 On the other islands I have visited, the vast majority of the population are black, the descendants of slaves brought to the area to work the sugar plantations. In Aruba, only about 15% of the population are black, with the majority being “mixed race”, that means their ancestry harks back to many groups. The local population that were before the Europeans arrived, people who have moved at some stage from the South American continent, Africans and Europeans. My journey from Saint Kitts to Bonaire was convoluted, to say the least. 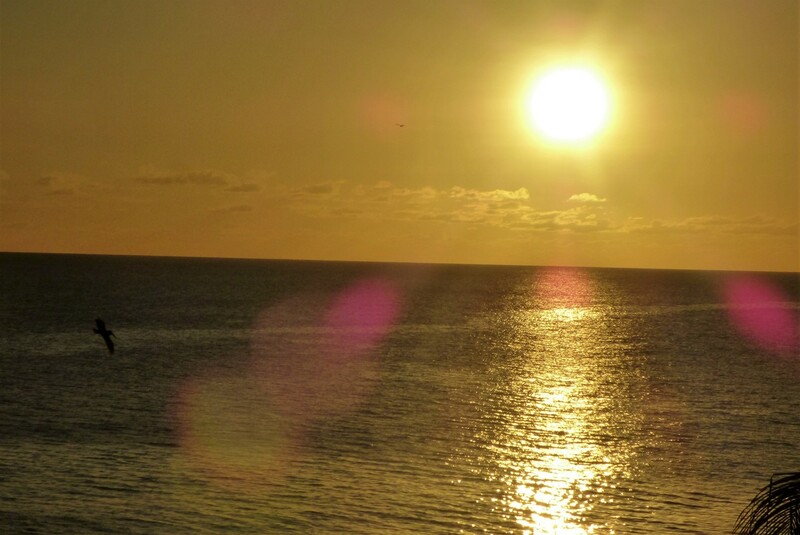 I started simply enough with a taxi to the airport and a flight back to Sint Maarten. Here I had a long wait in the temporary terminal while waiting for my connecting flight to Curacao. There is something to be said for a cramped airport terminal without air conditioning as you talk to those sitting next to you. The beer choices include the two Sint Maarten brewed craft beers that I had sampled before, (its just that in the airport, the price is double that on the boardwalk). I ignored the price and was in a good place when boarding the plane. I got to Curacao without incident and checked into the hotel. It was further from the town than I had envisaged, and there was a failure of communication over the airport pick up, meaning I had to wait for transport. I managed the walk to town and back. It was further than I thought. In the morning, I walked to the SUBT stadion, which is the secondary stadium for the local league. I took a few photos and noticing the office at the far side of the field was open, I walked across to have a chat. As my fixture list, confirmed by a phone call to the FA gave me Sunday fixtures in the top division at the National stadium, and Monday night on the FFK (Federashon Futbol Korsou) pitch next door. I was not expecting to see a game here. 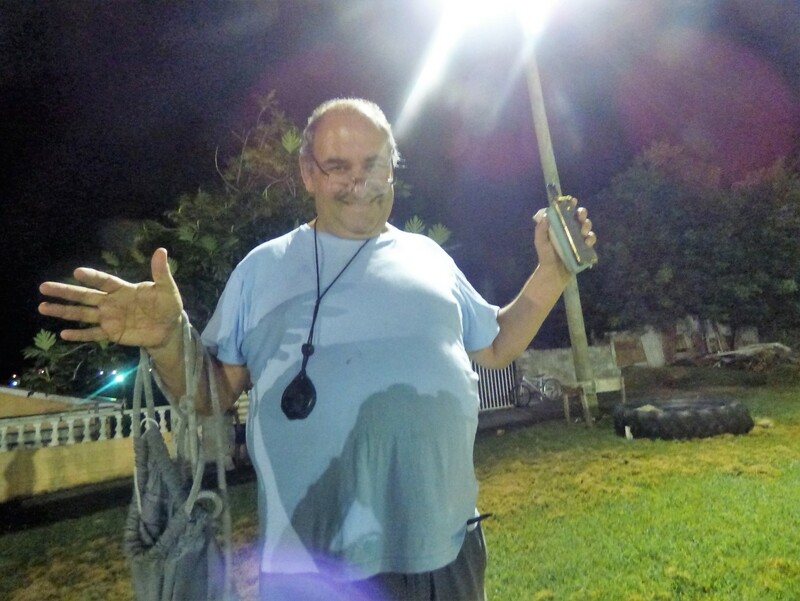 So, after asking about the ground – it is owned by one of the clubs, Sport Unie Brion Trappers. It is run as a club, and the name Brion is not a reference to the beer of the same name available on the island. I asked if there were any games there soon. The reply was that they did not think so, but we’ll just check with the FFK. It turned out that on the Tuesday, they had not been told as yet that all five top division games for the weekend had been switched to their ground. They were pleased to discover this, as it means more income. After that, its back to the accommodation, and on to Bonaire. I had booked with a local airline that gave a good price for my routes, which in basic terms were two return trips from Curacao, first to Bonaire and then to Aruba. However, I had a through booking Bonaire to Aruba and knew I would not miss the short connection time, as the flights would be on the same aircraft. At the airport, it is standard airline business, so all checked in and waiting at the gate with no mention of any delay until after departure time had passed. I later discovered that all this airline’s flights for the day had been cancelled, as had those for the next morning. I was told this was due to crew illness, but let’s face it – that does not add up. The most likely cause was a mechanical problem with the plane, which did not fly at all on the Tuesday, or before 16.00 on the next day. After a long wait, we were finally told that a plane would be found to fly us across to Bonaire just after 9 p.m., about five hours late. It turned out that this was a smaller plane, (the 19 seat de Havilland Dash 6). 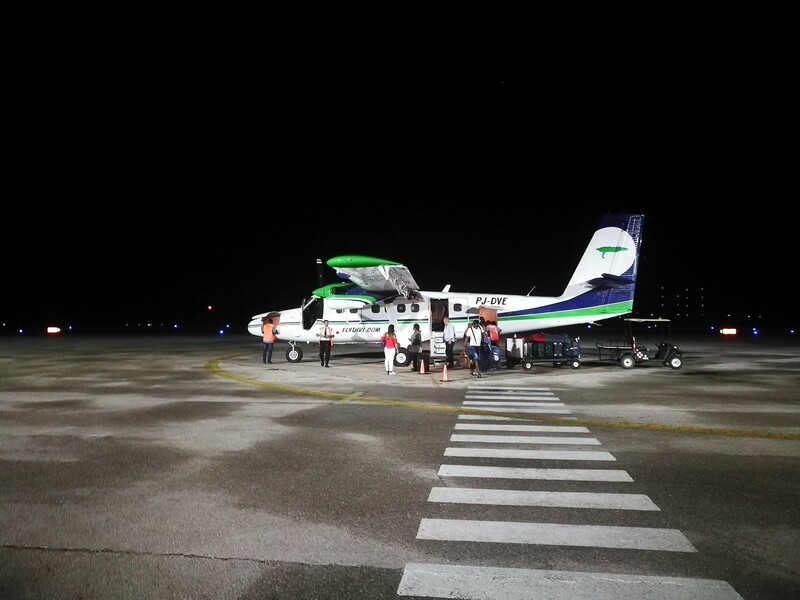 This basically spent its day running shuttle services between the three islands, and was now contracted to make an extra flight after its standard operations were finished. Fortunately, there were less than 19 passengers waiting (the Fokker F-50 scheduled to run the flight can carry about 60). After a long wait, I eventually arrived at my destination. My taxi driver told me that the staff at the accommodation would not be there on my arrival, and actually went as far as starting to phone them after my arrival, but actually there was someone waiting, who had received my new estimated arrival time sent in by e-mail once I had been appraised of the delay. The next morning, I had a short walk into town, the road around my accommodation was poor – slightly muddy gravel after rain in the morning. Once you got close to the centre though, it was a different matter with very tidy paving. Tourism on the island can be split into two groups. The cruise ships provide the high-end tours, and they demand the pristine city, with mainly taxi tours to other parts of the island. There is also a much more basic level. The island is well known for its dive spots, and also has several nature reserves away from main town. This results in many tourists looking for a somewhat cheaper experience and longer stays. A small distance out of town in the other direction is a football stadium. I went to have a look, but it was completely locked up with high walls so as I could not get a view. It is not currently in use, except for kids matches. Apparently, its artificial surface is 11 years old and can no longer meet FIFA standards. The local association is waiting on the local government to renew this. 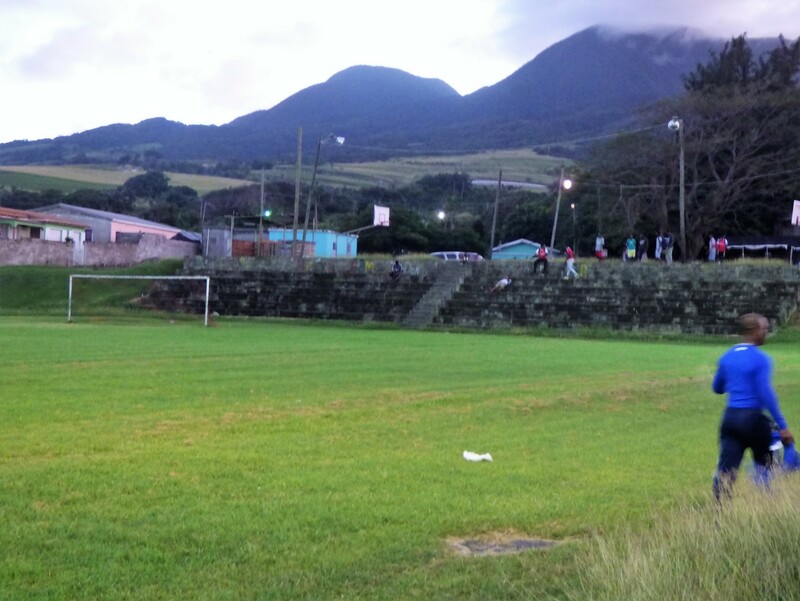 This means that at the moment, all league matches take place in Rincon, the island’s second biggest town. No where else is big enough to be a town, I think. I was not sure how best to get there. I made enquiries over a one-day car hire, but this was not a comfortable price. I then had what I thought was a stroke of luck, Ludwig Balentin, the president of the FFB said he would pick me up and sometime between 6.30 and 7.00 for the 8 p.m. kick off. By ten past seven, I was getting nervous, especially as trying to phone Ludwig got me nowhere. So, I gave in and called a taxi. As the taxi pulled up to pick me up, I actually received a call from Ludwig, asking where I was and suggesting I tried to find him. I explained I had booked a taxi, and would see him at the stadium. I think in retrospect, that although this added $25 to my costs, it was a wise move. Ludwig was also meeting a friend who had been working off the island and was still not at the stadium when I asked at half time. They actually made it before the second half started, which meant that I at least had a trip back. 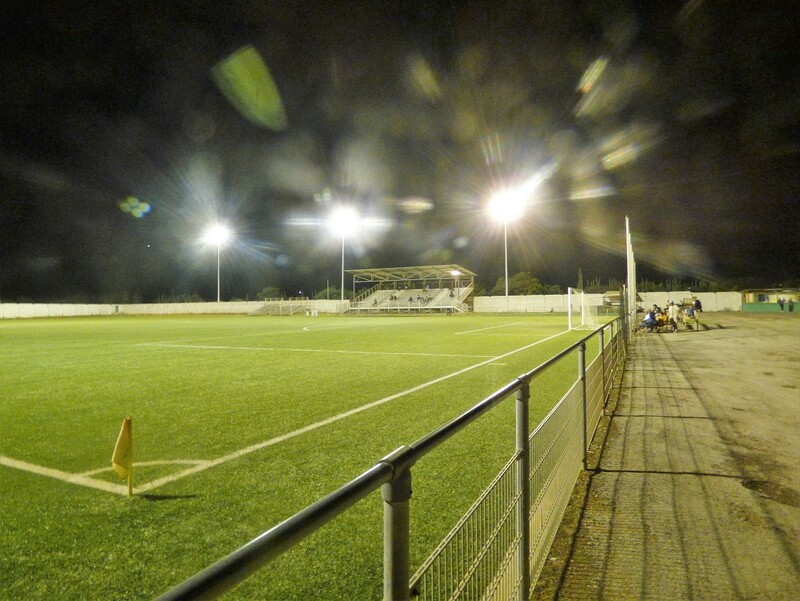 The stadium, Stadion Antonia Trinidad is quite simple. The pitch was artificial but in excellent condition, the floodlights were good enough to get a clear view. There is one main stand, erected on scaffolding with a roof, and several small structures with two or three rows of seats each. In one corner is the shortest corner flag pole I have ever seen. The other three were a little taller (but not much). Admission was US$3. I counted the crowd at 100, but more than half of them missed the start. People were still drifting in to the stadium up until half time. This meant that for many, the game was over as a contest before they had even arrived. SV Juventus, the “home” team were two goals to the good within 14 minutes. They were both fortuitous goals as well. A penalty in the fourth minute was for a hand ball which was not intended. Still, I can imagine the arguments in the match of the day studio, and feel that after filling enough air time to meet contractual commitments, they would conclude the referee was right. 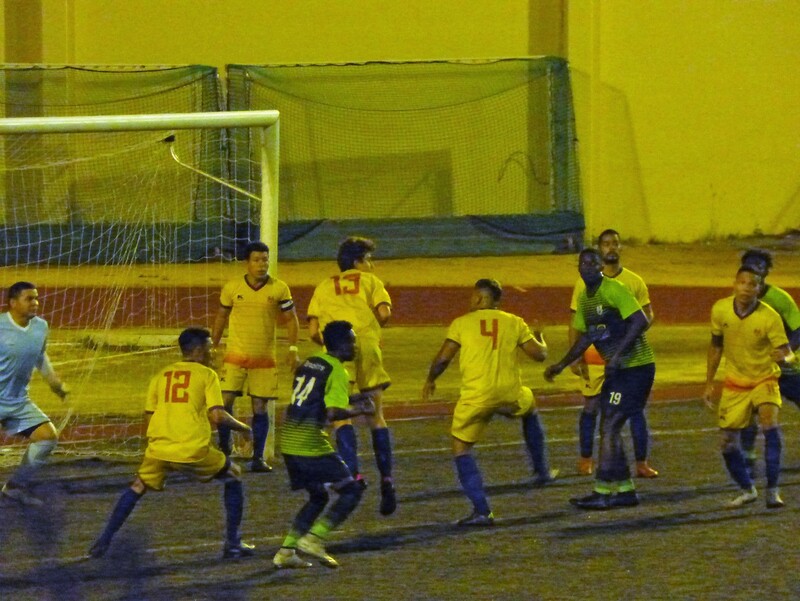 The second saw a defender send a looping header over his own goalkeeper. Generally, it was an entertaining game, with both sides playing attacking football, but both lacking a clarity of vision in the last quarter of the field. A common fault with football out here is the lack of running off the ball, and also that many players want to be the hero and hang onto the ball when there are passing opportunities. SV Uruguay pulled a goal back 18 minutes for time. 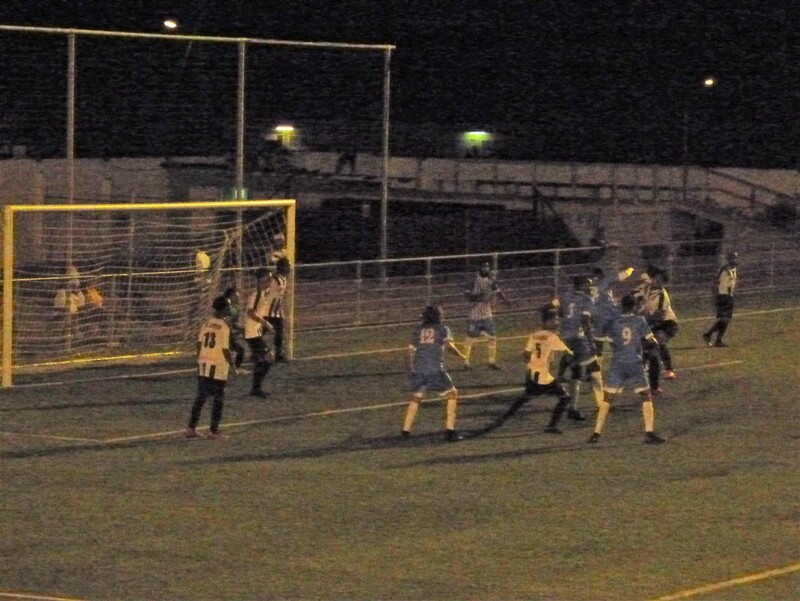 It was a typical centre halves goal scored with a header following a corner. Ludwig Balentin ferried me back to the accommodation, after a drinking session at a bar in Rincon, so it was close to midnight when I got to bed. Still, who cares – you are only old once!! I asked about the application for FIFA membership, which he says will go through, but then when pushed, it seems to be on an indefinite time line. It is clear that the Dutch applications of Bonaire and Sint Maarten have more chance of getting through FIFA, as KNVB supports them. The FFF are not supporting the applications from the French associations in the area which means they are on permanent hold unless they can change the federation’s mind. 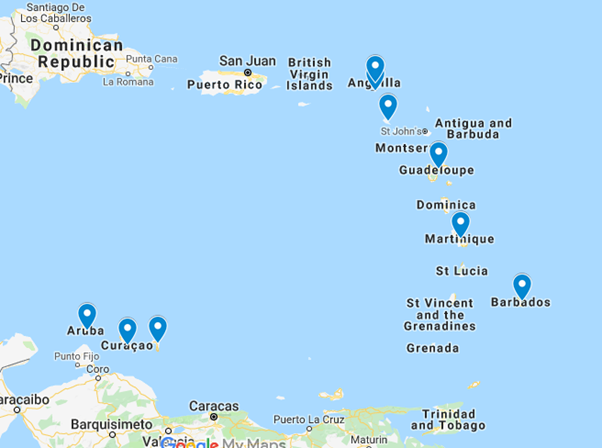 Although, with the exception of Rincon place names are not included in the club names, I am told the clubs do represent individual areas on the island. I am quite surprised to note how large the island is. It is larger than Aruba, my next destination even though the latter has five times the population. Getting to Saint Kitts from Sint Maarten is quite easy. 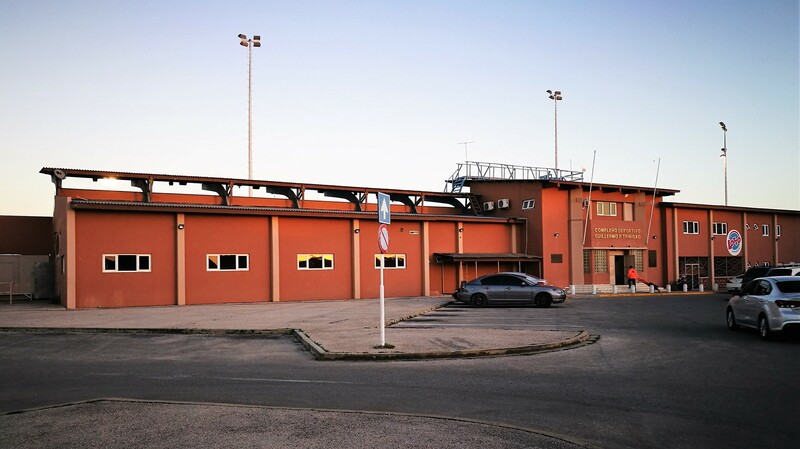 It is a short flight, and the most notable aspect is the temporary accommodation at the airport. This is not quite the last reminder of the Hurricane, as I have a stopover at the same airport on the way out of Saint Kitts as well. One of the first things you notice on St. Kitts is that while it may only be a short flight, it is a long distance in hurricane terms, and this island was not a sufferer from Irma. I am booked into the Bird Rock hotel, a fairly simple accommodation, chosen mainly on price. Its disadvantage being that it is a fair distance from any other facilities. I am travelling to a game the same night, and as I do not even know the exact location, I have no choice but to accept the taxi fares, and the quotes seem to be high. I am to discover that the quotes were fairly standard, and is just that taxi fares are high wherever you go here. Indeed, throughout my Caribbean trip so far, I have found that taxi fares cost more than most European cities. In Saint Kitts, the taxis are not the only things where cost is over the top compared to those I am used to in the UK. There are a number of touristy options available here, with the hotel being next to two of them. In the end, I decided against trying any of these due to price and in some case other factors. Some of these costs seem to be due to the fact that most of the tourists here are travelling on cruise ships and have actually paid for their side trips on board. It appears that the cruise ship passenger is willing to shell out fortunes in extras. Other factors also put me off, such as seeing the enclosures they keep the dolphins in for the Swimming with Dolphins trip. The dolphin area was adjacent to my hotel, and judging by the numbers there whenever a cruise ship is in, my feelings did not damage their business or help the dolphins themselves much. I have a brother who has cruised the area more than once, and he says I am probably right about the dolphins, and he says that while the price for Scuba diving is not extortionate, full Scuba diving should not be on offer to untrained customer who do not have a PADI certificate. I know someone who does dive training and I and I am sure he would agree. Anyway, back to the football. 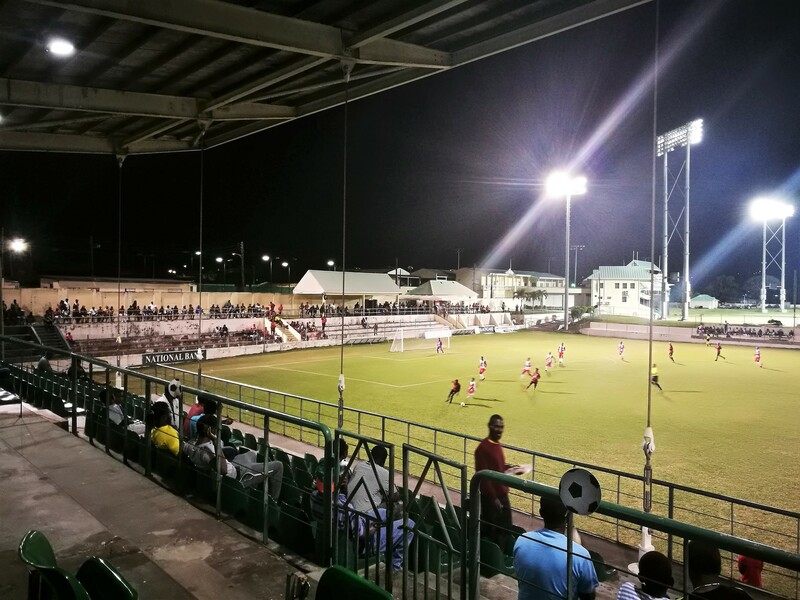 The Saint Kitts and Nevis League has two divisions, with all the Premier division league matches being staged at the Warner Park Football Stadium at the weekend. 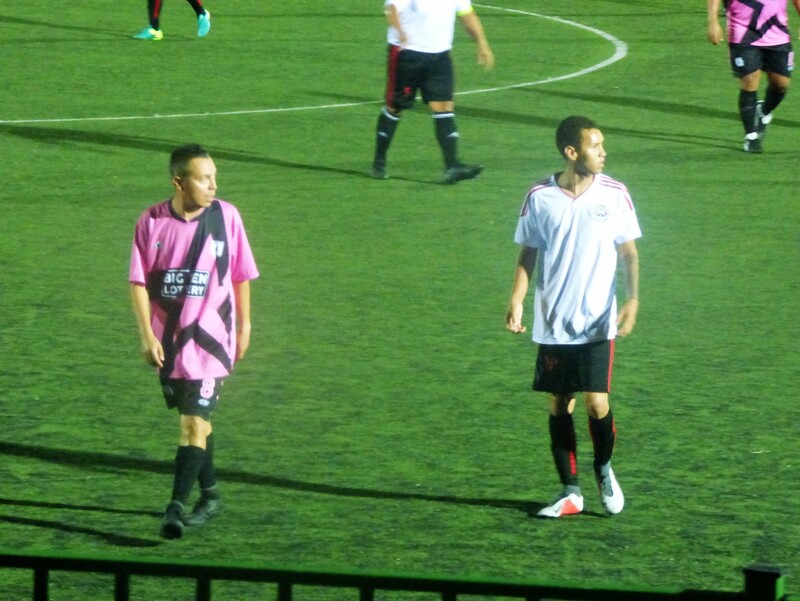 The division one games are staged across the islands, and there are matches most Tuesdays, Thursdays and Saturdays. 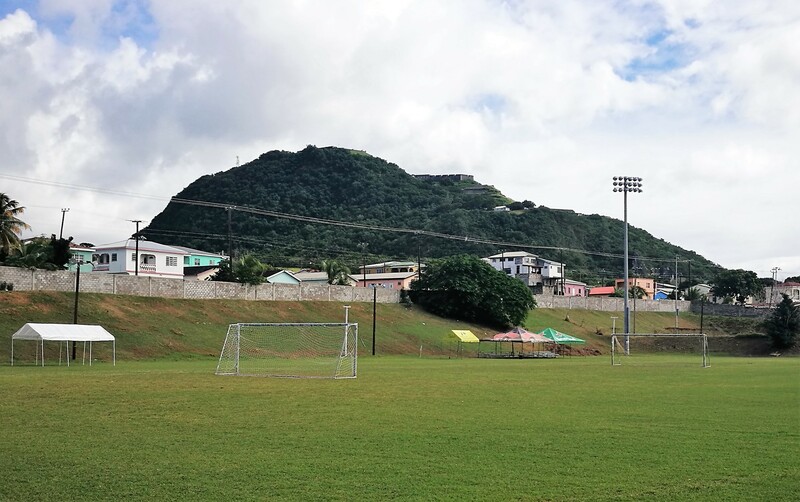 The mid-week games are scheduled for 6 p.m., and the Saturday games are at 3 p.m. Two of the teams in Division One are based on Nevis, the smaller island of the couplet that make up this country. Both of these share a ground. All of their games take place at 3 p.m. on Saturday, as it is difficult to travel between the isles for evening games. A couple of seasons ago, Bath United were in the Premier League, meaning all the games that season were at Warner Park. 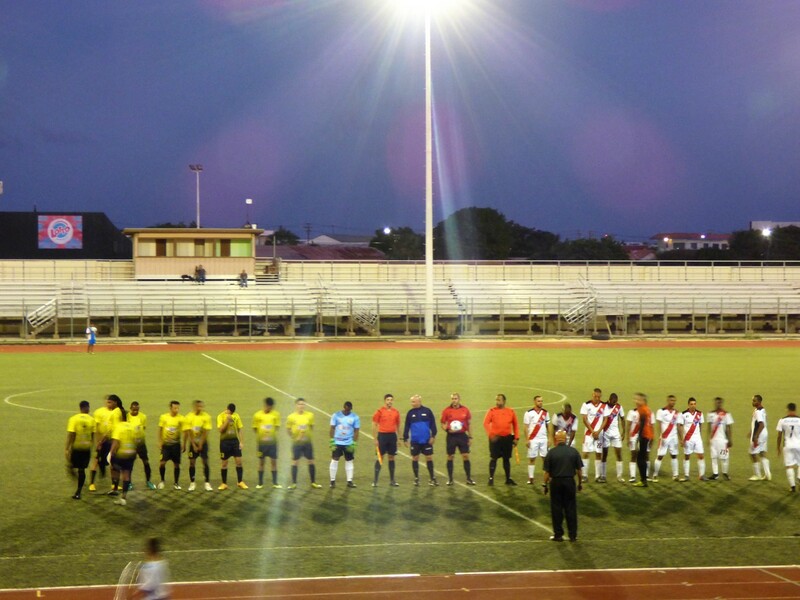 So, my first match on Saint Kitts involved a taxi ride, and started a couple of hours after arrival at the hotel. 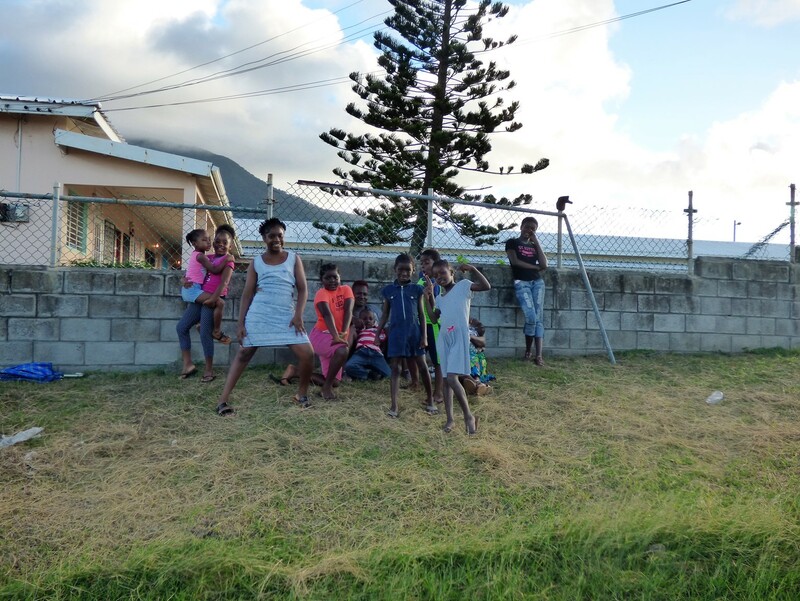 With the exception of the island’s tail, a narrow strip of land to the south and close to Nevis, all of the island’s villages are close to a single road that makes a circuit of the island. The centre being a series of three mountain peaks, that are old volcanoes. Many of the Caribbean islands have been formed in this way, with mountainous volcanic peaks in the centre. The villages are roughly the locations of residential areas that date back to the slavery era, when each would be a plantation with a different owner exploiting the imported work force as labour. 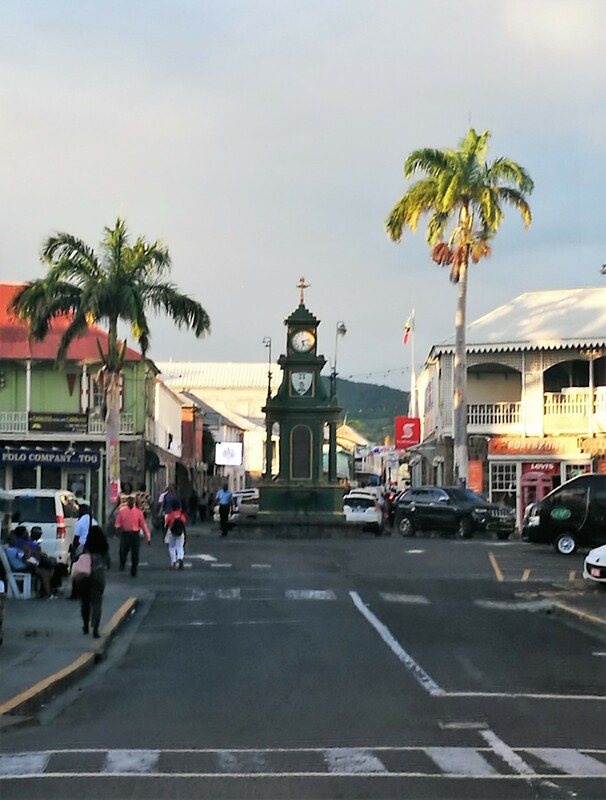 As with most of the islands that depended on this economy, there was a collapse after the emancipation of the slave labour force, as the sugar plantations were not economical once it became necessary to pay the workforce. 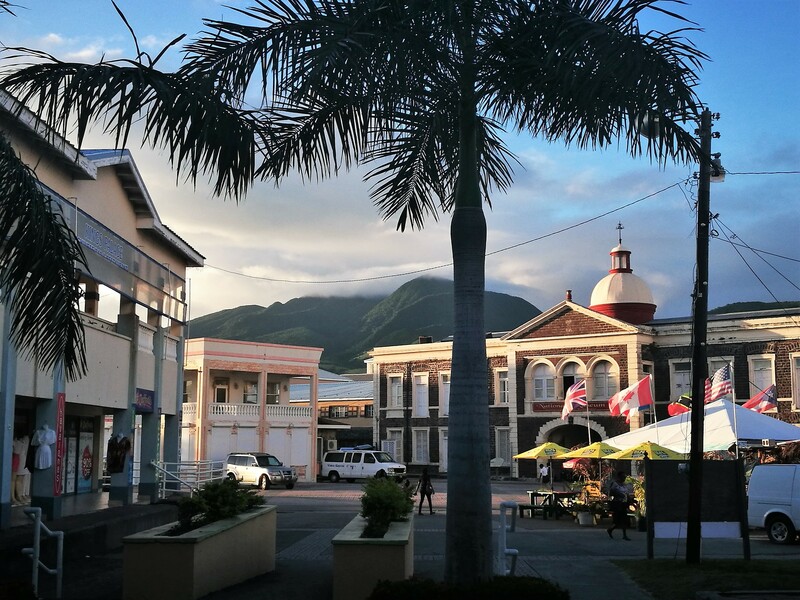 The new economy of islands such as Saint Kitts now depends on fleecing the tourists. If you put it another way, the descendants of former slaves are now overcharging the descendants of former countrymen of slavers. I was heading to Ottley’s. A village on the north side of the island. I had to pay the taxi fares here, and although there was some negotiation, I still felt I was overpaying. In fact, it appears I was not overpaying by local standards, it is just that the pricing here is high. I paid EC$150 for a return journey of no more then 10 km each way. That is about £40. At least as the driver was happy for me to pay only on the return run, I knew he was going to arrive and take me back. The comment from the FA was “there is only one field in each village”, when I asked about addresses and directions. This was true, as when we arrived in Ottley’s, we could see the floodlights and it was easy for the driver to drop me and arrange a time to pick me up again. He did at least give me a quick opportunity to ask whether I was in the right place, as we were around 20 minutes before kick-off, and apart from the fact it was a football ground and the floodlights were on, there was no sign of the game. I thought I would try and find my way to the dressing rooms – at which point one discovers that this grassed area close to the road was in fact the home dressing room. At one end of the field, there was an area where a grass bank gave way to a series of concrete steps. About ten minutes after my arrival, this became the away team dressing room! About the same time, the referee arrived and changed next to his car and not far from the home area. The pitch itself was a somewhat bumpy grass surface, but not in bad condition. The floodlights were on the top of wooden telegraph poles, two on each of six poles, except one light was out. Even if all twelve were working, the lighting level would be poor and very patchy. We eventually got away thirty minutes after the scheduled kick off time. Even at this point, we were not fully ready – the home side were short of one player. Worse still, from their point of view the missing player was the goalkeeper. When he took the field, ten minutes after the scheduled kick off time, his side were 1-0 up. It did not stay that way. The home side was Lodge Patriots, with Lodge being the next village further down the road further than my journey. The away side was Trinity/Challengers United. Both sides have a sponsor’s name tagged in front of the name. It was easy to work out that Davis Construction, with the name plastered all over the shirts were the sponsors for Lodge, but less easy to decide on the opposition. The full name was given as KFC Trinity/Challengers United. The sponsorship does not go as far as getting names on shirts, as I was to find out over the week, only a minority of sponsors go to the extent of putting the names on shirts. Hence, I needed to check further to find that Trinity and Challengers are adjacent villages on the south side of the island, and the sponsor is indeed the fast food company. 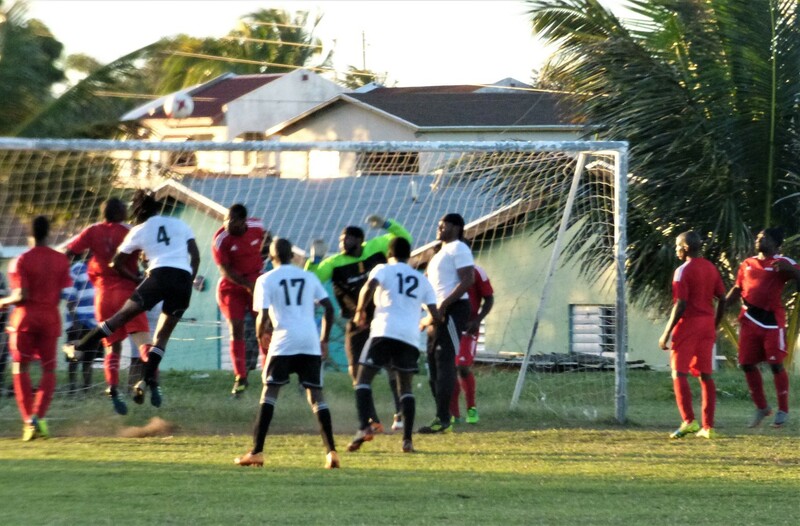 With eleven men on the field, Lodge Patriots soon surrendered their lead, and then regained it before two goals in a few minutes before the break meant they went in a goal behind. Again, the scores were level at three each, three minutes into the second half, but fifteen minutes later when Clyde Herbert scored a penalty for Trinity/Challengers United, it put his side 7-3 up. For Herbert this was a great individual achievement as well, as this was his fourth in the match. There were no further goals for ten minutes, and then another short burst of two goals in four minutes brought the patriots back to 7-5. This may give them some hope, but in fact the final quarter of an hour went by without further score. This was the first game I had ever seen to end with a 5-7 score line. With over 6,000 matches in my records, first time score lines are rare and now mean a minimum of ten goals in a game. This was only the fourth occasion have I seen both teams score five (or more) in a match. I went into the FA offices before the next game. 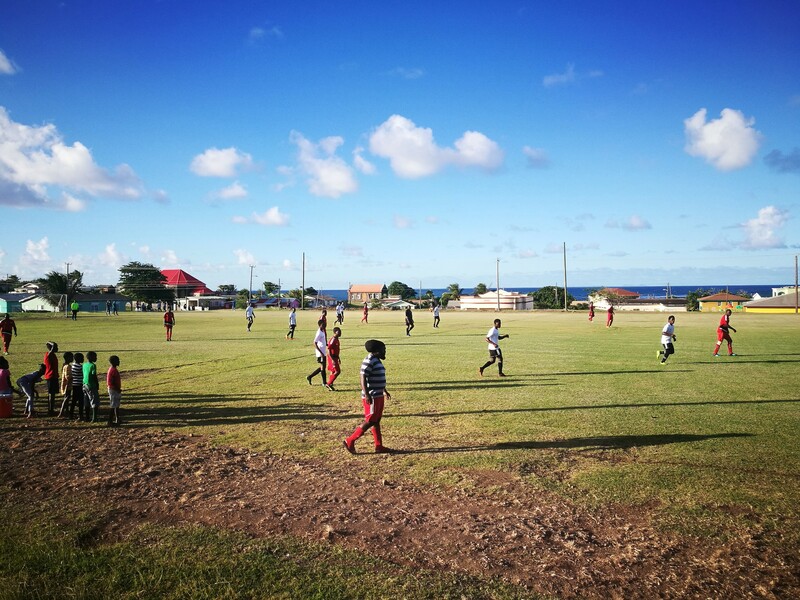 The contrast between the office of an association such as St Kitts and Nevis and Sint Maarten are pronounced, and shows the benefits of having FIFA membership. While Sint Maarten’s main officials are all amateur, with jobs of their own between matches, and the FA has an administrative staff of one, who deals with all the league matches and registrations as well as the e-mails from people like me, the Saint Kitts and Nevis FA had five people in the office when I arrived. Most of the information I needed to see the games was easily obtained from the receptionist, Makeda. I then had a chat with Dexter Tyrell and Lenny Lake who were in the office. 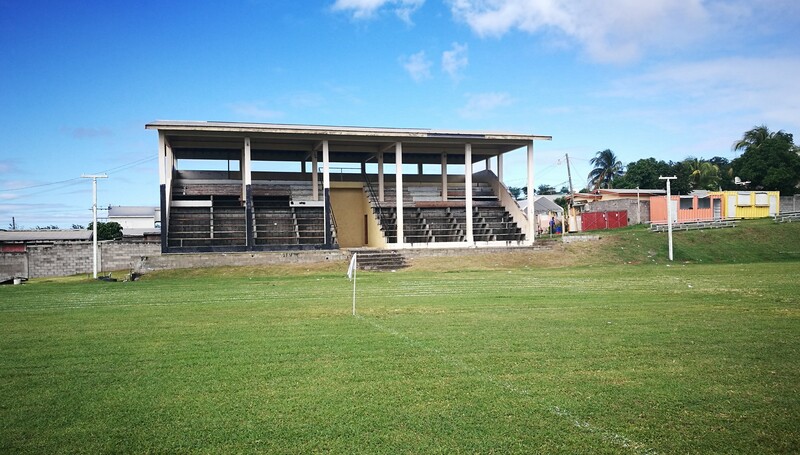 Everyone repeated the advice given to me at the game on Tuesday – that going to Nevis would be pointless in football terms as the away team would not turn up. It is clear that the league is struggling to run its lower division. It started the season with 14 teams, but is now down to 12. As far as I can see, teams will not be fined or disciplined if they do not turn up for games, but will simply have a default result recorded against them. The main island is quite small – the main road that creates a circuit around the coast is about 30 km long, but it can still be difficult to get from one village to another. There are bus services along this road, but no timetables and probably little or no evening service. Taxi prices have been set with tourists in mind, and even though I expect the locals can get a lower rate, it is clear that they are not within the scope for the average citizen. At the end of the season, the top four in each division has a play-off. For the Premier division, this is after everyone has played each other three times. It is a ten-team league, so that is 27 games each (all at the one stadium). In the First division, the clubs play the standard home and away sequence, so 22 games each now the league is down to 12 members. The top four competitions are all played at Warner Park over the course of a week. For the first division, the top two in this series (with no benefit from the earlier 22 games) gets promotion. For the Premier, again there is no advantage from the earlier games, they are just to get you there. The top two then play a final – which is basically a best of three series. The clubs play two games, (decided on penalties if drawn). If the two winners are not the same, then a third deciding game takes place. Last season was not typical, Village Superstars lived up to their name and won the original series, all three of the “top four” games and the two games in the final. Looking back further, it seems the regular season champion rarely wins the play-off series. In 2017, Saint Pauls were top of the regular season, four points ahead, but then missed out on the finals on goal difference. Cayon won all three games at that stage and also both games in the final. In 2016, Newtown were top, by four points. They beat Cayon 3-1 in the final game, meaning Cayon scraped into the final four on goal difference. As this was the final game, Cayon knew all they had to do in that game was avoid a seven-goal defeat. If Garden Hotspurs (who just missed out) had not been held 0-0 in their preceding game, one wonders if the last one would have been different. One of the catches of a single stadium league is you cannot even have the final day matches played at the same time. Newtown picked up just one point in the next three games, and finished bottom of the group of four, while Cayon were second to Conaree. The same pairing as I was to see as my last game. In the final, Conaree won 2-0 at the first attempt, but Cayon won the second game 1-0. This was the only year the final has gone to three matches, although it should be pointed out that is a recently added option. The third game was 0-0, so despite finishing below Conaree in the main season and the final three games, and even being 2-1 down on aggregate over three games, Cayon were allowed to take the title on a penalty shoot-out! Not surprisingly, a few of the people I spoke to disagree with the format. I can understand their frustrations, as they play all season and then the prizes are delivered in a few games in the last week or two. I think I know the main reason why the FA wishes to keep the format though. When I was at the office, I asked why all the top division matches and most ladies’ games are at the same stadium, despite the fact that several of the clubs have decent stadiums of their own. The answer I was told was in the financing. 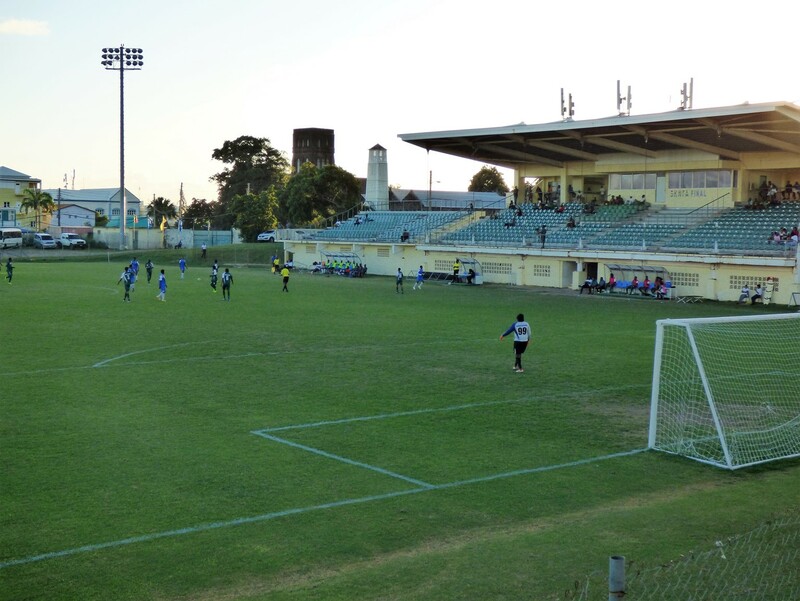 The SKNFA pay a fixed lease fee for the stadium each season, regardless of the number of matches played on it. They then charge 15 East Caribbean Dollars for each person that enters. My estimates were that there were around 350 in the stadium on Saturday and 450 on Sunday. 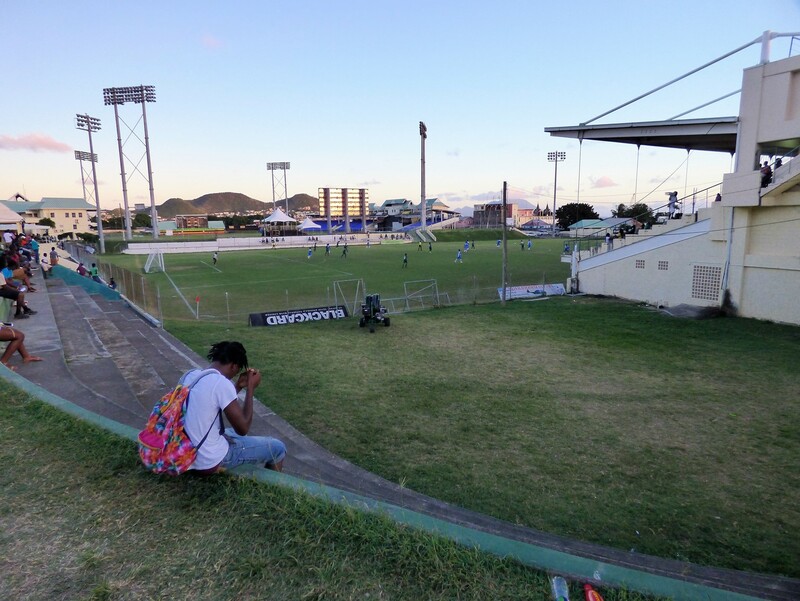 There will surely have been many that did not pay to get in, (the FA promised me a free ticket, but did not actually deliver), but I would still expect that over EC$10,000 would be taken. This may only equate to around £3,000 per week but probably this is essential income to the FA. 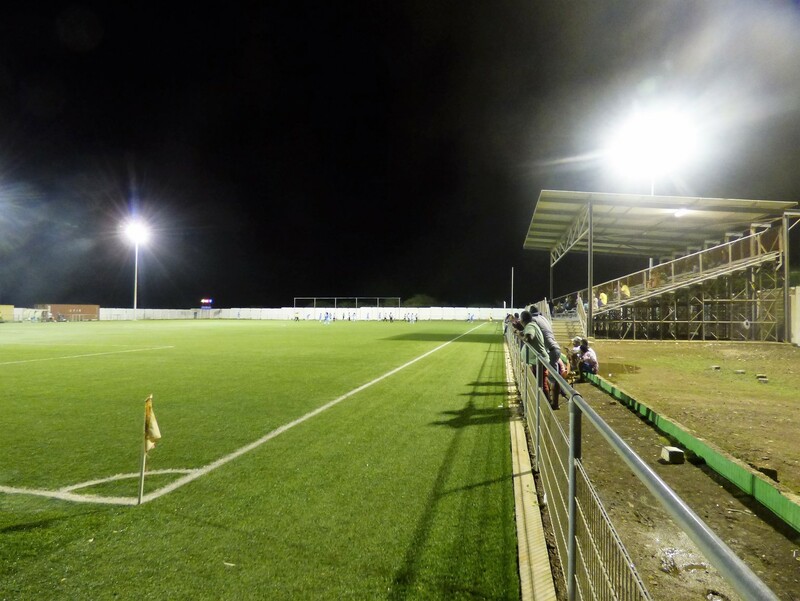 It tends to be the better supported clubs that have the better grounds and so moving the matches elsewhere may be good for the clubs, but not for the SKNFA. Similarly, the play-offs and finals at the end of the season are liable to draw even larger crowds to the stadium, and as we all know, income trumps competitive fairness at almost every step. I can easily think of a couple of ideas that makes a small step in improving things. The most obvious is to use the positions in the regular season table as a tie breaker rather than goal difference. Other possibilities would be to give a points advantage before the play-offs start and certainly not to allow the final match to end 0-0 and be decided by a shoot-out. I would also consider changing the promotion play-off from Division One to the Premier, so as only three Division one sides competed along with the second bottom team from the Premier. Anyway, after my visit to the FA, I went into the centre to look around and have a small meal before moving on. When you drop down the road from the FA offices to the town you start by passing through an area which I would consider normal. A bit untidy, various shops and businesses, and then onto the few notable remaining colonial era buildings. 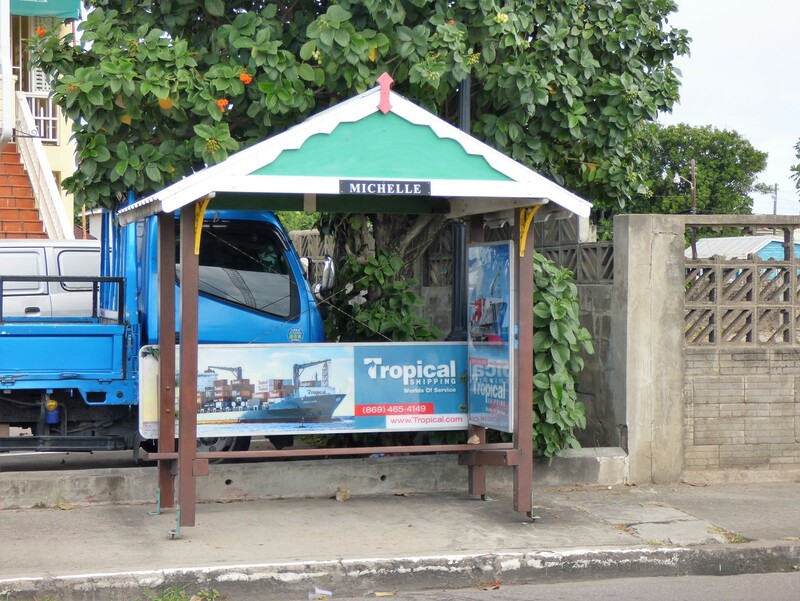 If you head to the right, you can find the ferry terminal for boats to Nevis and the local bus station. If you do not take the turn, but head past the colonial building that is now the national museum, you enter another world. For a start, the area is pedestrianised, and the paving is even. The shops here are either selling high value products, (a lot of gold and jewellery on sale), or tourist tat. I was going to say cheap, but the price here for a T-Shirt with a St. Kitts slogan on it, (made in Honduras) will not allow that description. Large signs pointing the way “back to ship” allow the cruise passengers to safely find their way back out of this sanitised area. There were two cruise ships in port that day, and as I started to wander away from that area, both could be seen sailing away. 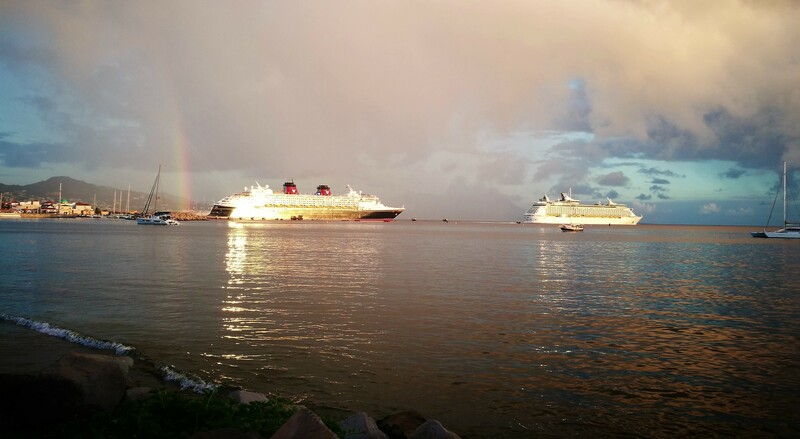 It is apparently unusual for cruise ships to stay in port here overnight and as such the facilities and tours are all based on visitors not spending more than around 8 hours on the visit. I only had to walk twenty minutes from the centre before I reached the village of Lime Kiln. This is the location of the brewery in Saint Kitts, and also the hospital. To some extent this ground was similar to the one already visited. Depending on your view, it could be better or worse. The land slopes down gently from the brewery to the see, and the pitch has been levelled out from this slope. 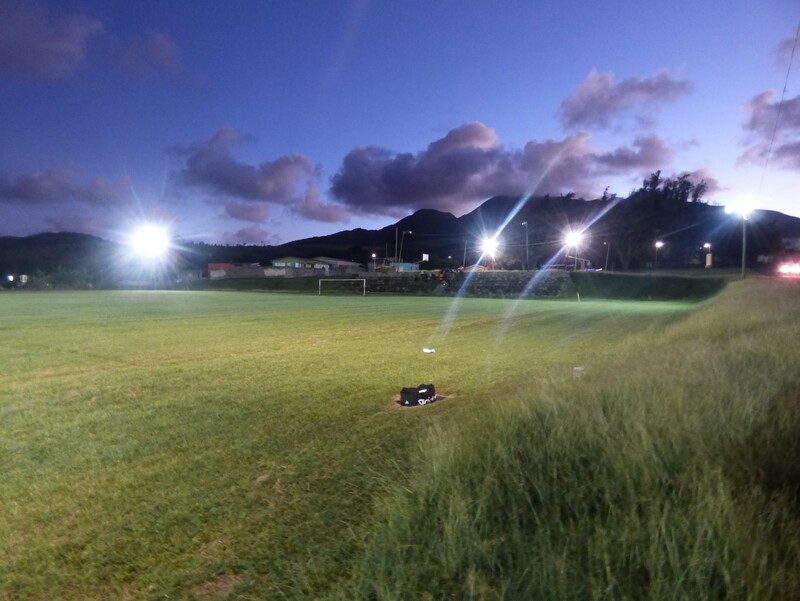 The intention is to allow cricket to be played here as well as football and this means one of the floodlight pylons is located around 30 yards further beyond the touchline than the others, with an unsurprising knock on effect on the lighting. In one corner, the vegetation that comes close to pitch has not been cut back – so not only is there no run up for the corner, but the quarter circle in the corner is also overgrown. Some areas of the pitch have lost all sign of grass, while others are need of a cut back as strands of longer grass reach well above the rest. Because the pitch has been levelled, the ground drops away quickly behind one end’s goal. The advantage this one has over Tuesday night is at the top of an embankment between the goal and the brewery. Here the land has again been levelled, with the section closest to the road used as a car park, and that furthest from the road being a hard court with basketball nets. Between the two is a wooden shack with seats outside and a small veranda in case of rain. Yes – the ground has a bar. This is independent from the football club and very well used. The match was not as exciting as the game on Tuesday. 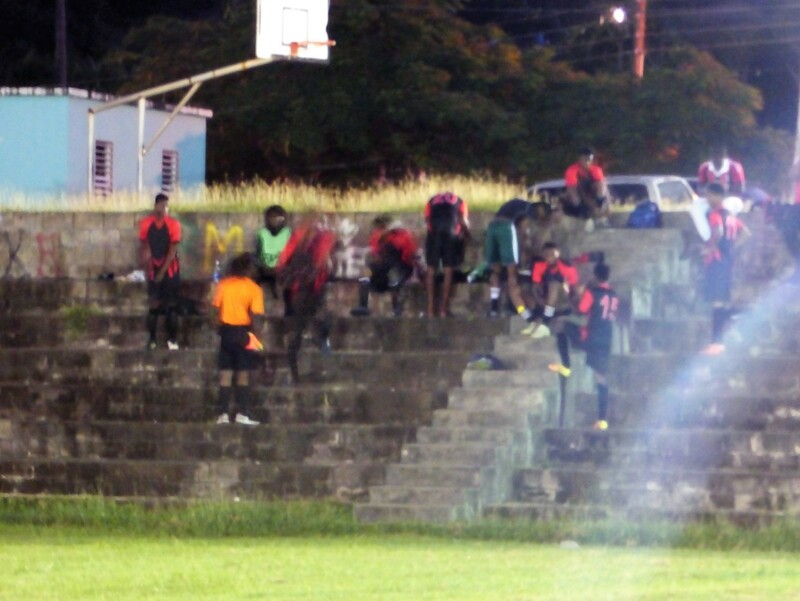 The home side, Trafalgar Southstars, had won seven out of eight and were second in the league behind Hardtimes United, (one of the two clubs on Nevis). I am not certain here whether or not Trafalgar is a sponsor’s name. The visitors from Sandy Point certainly have a sponsor, and are listed as Electrofab Sandy Point. They were actually listed under a different sponsor’s name on the original fixture list I was sent. Trafalgar completely dominated the first half and really should have had more than the two goals scored – one at each end of the period. In particular, I could not explain the one disallowed for offside. Sandy Point were better organised in the second half, and gave their opponents a game, but generally they got the ball forward and then failed to find their own players. By comparison, the Southstars were far better at coming forward, but had run out of steam in the second period and while threatening to increase the score, the threat was without never realised. We had a lot of added time, this appears mainly the time taken looking for the ball after it had been kicked down the hill behind the goal. This reminds me of playing as a kid, with only one ball available, so that you always have to go and find it when it runs away, or lands in a neighbour’s garden. 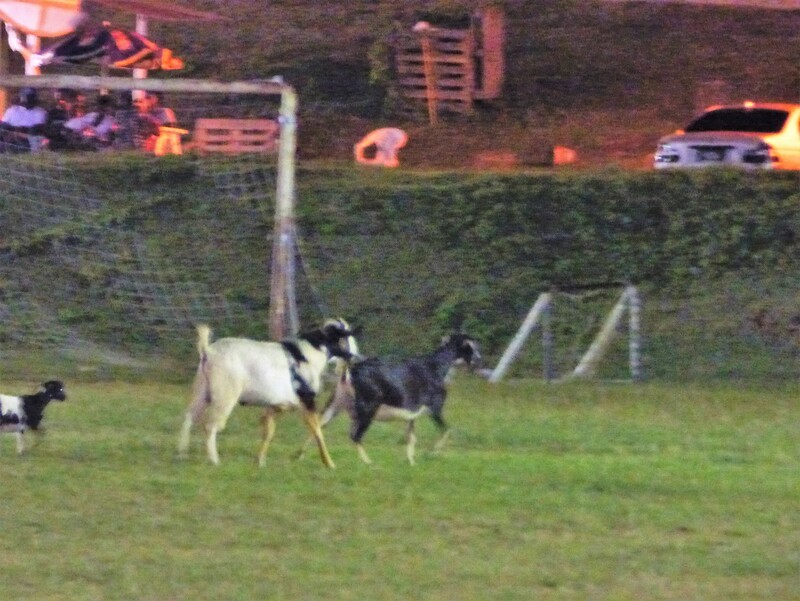 At one point, midway through the half, a family of three goats invaded the pitch and ran around a little. Although it took about two minutes to clear them away, this did not add to the time as the ball was missing behind the goal for the whole period. 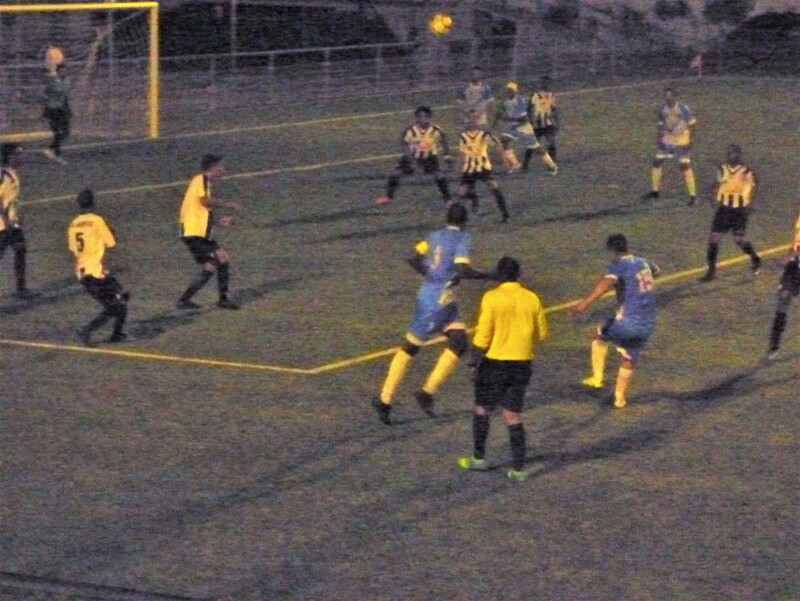 The Sandy Point goal was scored in the last minute of injury time, a close range tap in after a corner. Had Sandy Point won, they would have been level on points with Trafalgar, but this result moved Trafalgar within sight of the top position two points behind Hardtimes, and with a game in hand. The attendance figure for this one, which I estimated at 40 was about twice that for the game two days earlier. I tried to estimate how many of those in the bar area were watching the game. Clearly the bar was helpful in bringing locals to the ground, while the game probably also helps in bringing people to the bar. The next football was Saturday. I had accepted the advice not to go to Nevis, so it was disappointing to see a result for the game when Monday came. The alternative was at Dieppe Bay. This is considered to be the furthest point from the capital, which is roughly true. In the capital, one of the few signposts is to Dieppe Bay – but it is signed to the same place both to the left (14 km) and the right (12 km). I made my way to the bus terminal (on foot, about a 40-minute walk from the hotel), stopping at the only coffee shop I had spotted. Its in the cruise tour zone, so priced in US$. I stayed there long enough to have a clear indication that Cheltenham were not playing in the third round of the FA Cup. I then got the bus to Sandy Point, but I did not fancy the walk up to the fort which was one of the main defences when Britain, Spain and France were competing for which of the islands each would control. Instead I had a look at the sports ground there. 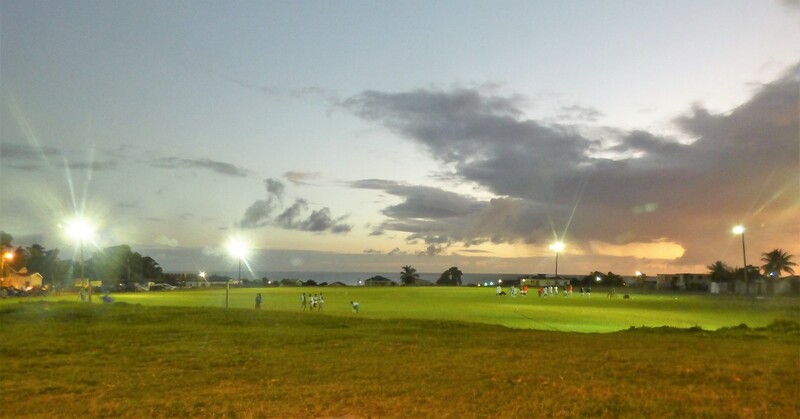 This is one of the better facilities although the field is shared by three sports, Cricket, Football and Athletics. There is a small stand which would be behind one corner flag in a football game. 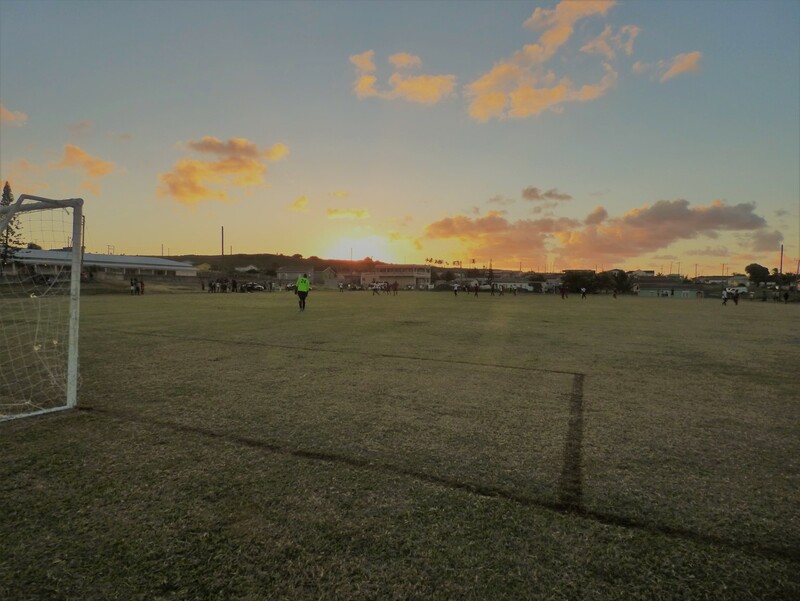 A running track had been marked out, running around the boundary lines of the cricket pitch – so certainly more than 400 metres. I spoke to the couple who run the bar, situated just outside the gate. They were also doing some of the caretaker work on the field. Business is brisk whenever sport is being played, but I was the only visitor around on a Saturday lunchtime with no events. They had a Mackeson beer, so I did partake. I then walked further down the road, finding another stopping place to have my lunch before taking another bus around to the northern tip of the island. The buses are probably not travelling that fast, but on the narrow roads, they certainly seem to be fast. It reminds me of the lines in the Hitchhikers Guide to the Galaxy where speed is described as relative to your perceptions, but that regardless of this, Arthur Dent was travelling too fast. 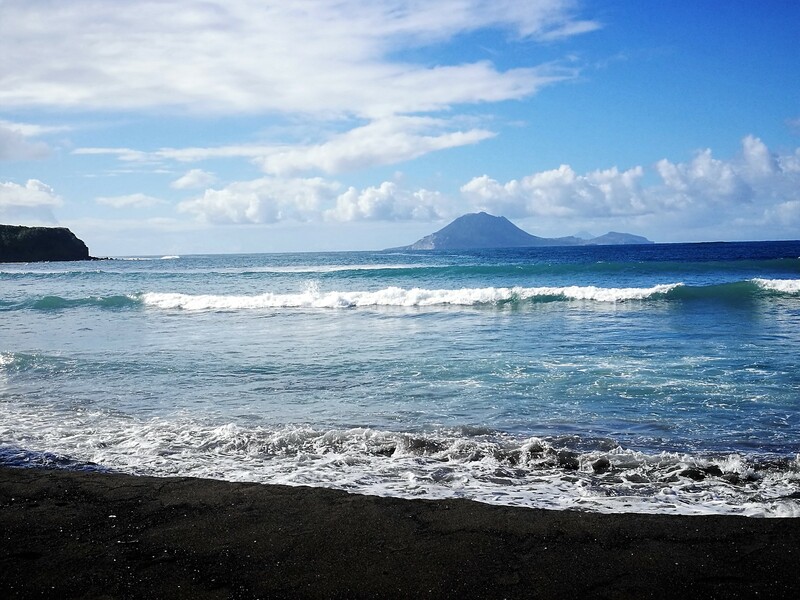 When I got there, Dieppe Bay reminded me most of all of the other villages I had seen on Saint Kitts. Small, mainly residential with a scattering of shops, bars or what they call eateries. It was a short walk from the bus stop to the beach. The beach itself had a small area with the black sands that seems to be the feature of most beaches here. I am guessing the sand comes from volcanic rock, but it looks far less appealing then the white sands of the other islands. Dieppe Bay Eagles, (preceded by the initials TGE, a local engineering firm) would want to get the game played as they would gain a greater advantage by playing and winning well, then if the match did not start and was forfeited. The referee, who was telling me this knew that a forfeit gave the points away, but not how many goals were added to the goal difference. He thought it might be three. The away team was Molineux Pitbulls. No sponsors name attached and from a village just off the main road. At around 3.30, I could count six players hanging around at their end of the field. I walked over to see whether they were expecting more, and was asked if I could play in goal. I excused myself on grounds of age, although the player who asked me then said he was 55. In fact, their keeper was already there, while the 55-year-old would play at full back. Two more players arrived around about 3.30. They walked in, and my suspicion was they were waiting just out of sight so as the referee could not force a quick start. We actually only kicked off a few minutes before four o’clock – but which time they could submit a team list with fourteen names on it. Twelve were actually at the field, while the last two turned up around 30 minutes later. 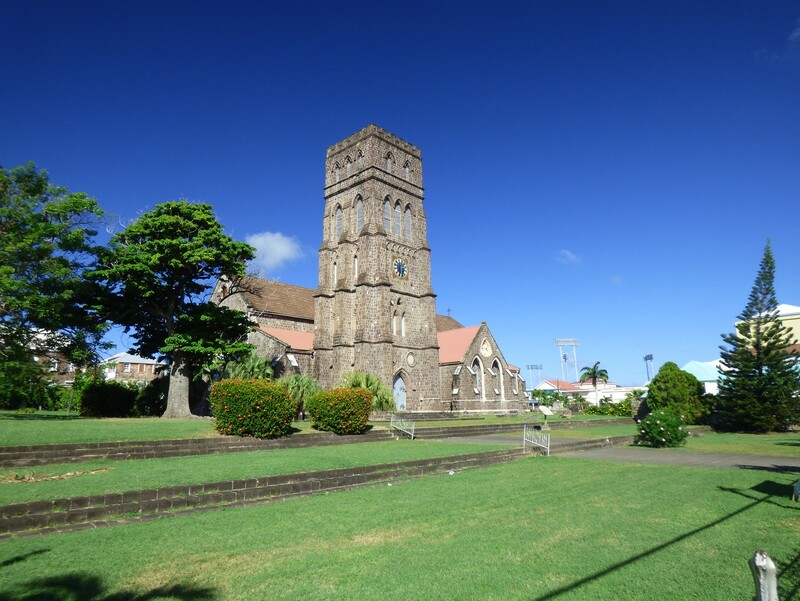 Saint Kitts is four hours of time difference from the UK, and actually sits on the meridian for this time zone. At this time of year, the sun is above the horizon for 11 hours of the day, which means Sunrise around 6.30 and sunset around 5.30 p.m. 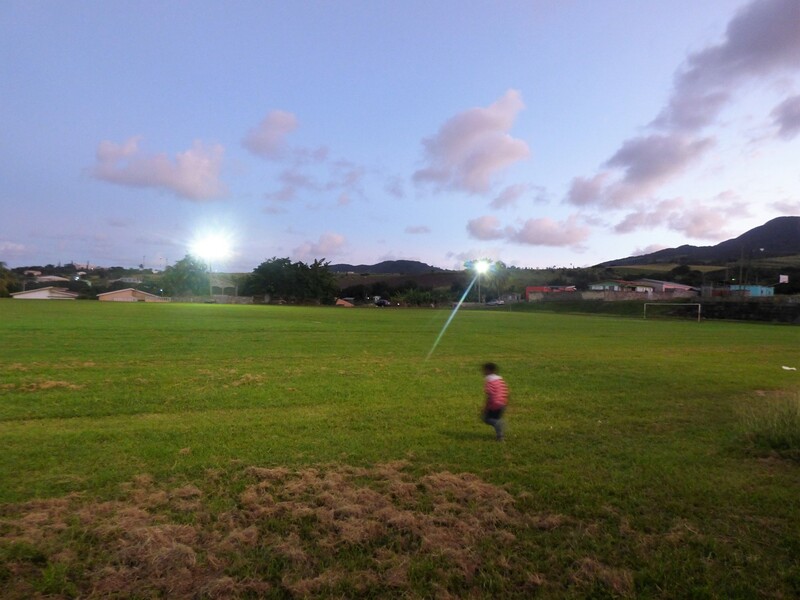 The ground at Dieppe Bay does not have floodlights, although six wooden poles have been erected and the disturbed ground says this is recent – so I would expect the field to get floodlit within the next few months. One consequence of not being lit is the pitch was the best of those I had seen for Division one games. It appeared well tended and as it cannot be used in the evenings, it does not get as much use as other grounds. 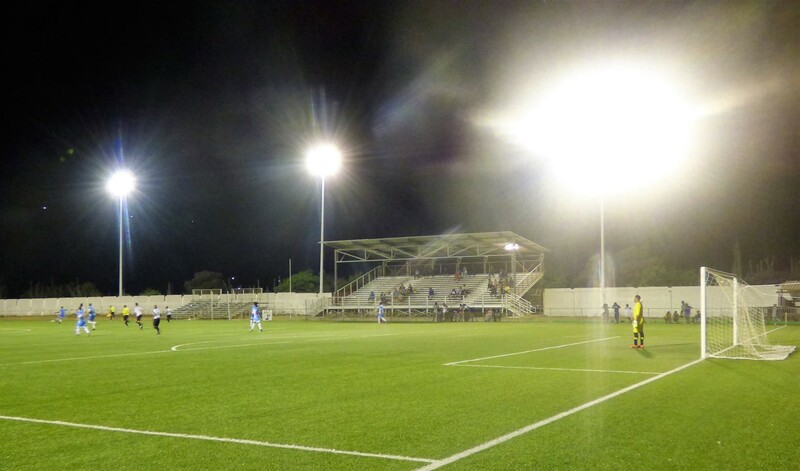 Still, the home coach told me that he will be pleased when the lights are up and his team can train on the pitch. A kick off as late as 4 means the light is fading by the end of the game. Dieppe Bay were relegated at the end of last season and have spent only one season in the top division. I do not have all the tables for the lower division, but I know that Dieppe Bay finished top in the regular season 2015/16, only to lose out in the final four with Sandy Bay and United Old Road Jets gaining promotion. 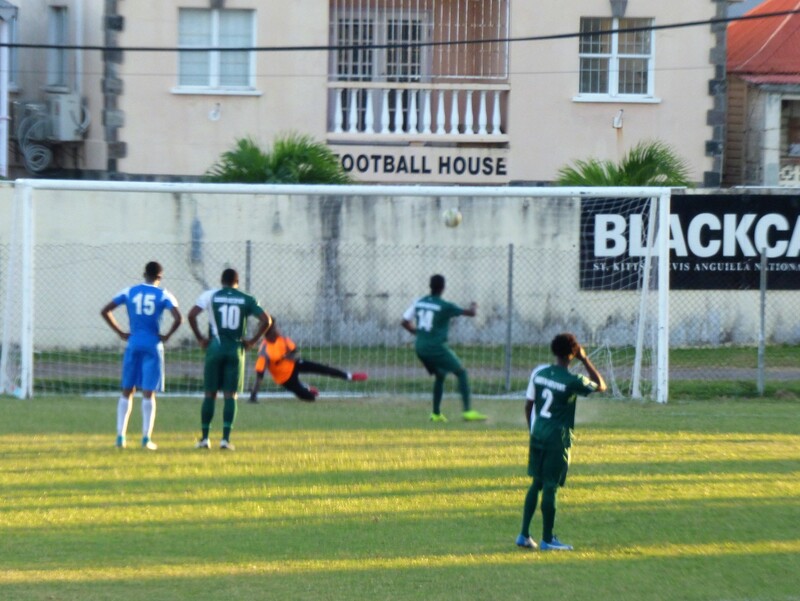 In 2016/17, both Sandy Bay and Old Road Jets were relegated, while Dieppe Bay and St Thomas Trinity went up. Last season, St Thomas Trinity and Dieppe Bay went down, (although Saddlers actually finished below St. Thomas in the final table. It appears St. Thomas are now merged into the team I saw as Trinity/Challengers). This season, the new promoted teams United Old Road Jets (again) and Mantab (representing the villages of Mansion and Tabernacle) are currently the bottom two. Onto the game, and I think I was expecting Dieppe Bay to impress from the start, having seen the disorganised arrival of their opposition, but the first half was a closely matched affair. The Eagles were always more in control, but Pitbulls also shared much of the possession. At half time, the score was just 1-0, and just before the break, Dieppe Bay Eagles had a man sent off. If this was meant to give hope to the visitors, the first few minutes of the second period took it way again. A long-range shot surprised the visiting keeper and flew in for 2-0 and the Pitbulls collapsed, with Shawn Dorsette adding a second half hat-trick and Dieppe Bay Eagles rolling on to win by 6-0. Dieppe Bay are still in fifth place, but only a point behind Sandy Point and with a game in hand. Molineux Pitbulls have lost ten games out of ten. Still only behind the St Pauls Youth & Experience team on goal difference, but the Y&E have played only seven. Even without a bar on site, the match brought out a number of local families and kids to watch, and I estimated the attendance at around 50. At the end of the game, I headed back down to the road. In the main centre and its neighbourhood, all the bus stops are clearly marked, with little shelters. All of them appear to have girls’ names. They also have the useful feature of a USB charge point. Out in the villages it is much less formal. There was someone else apparently waiting for the bus, so I went and stood with him. I said I wanted to go back to Basseterre. After about five minutes, we hailed a bus down on the opposite side of the road, and my companion asked if he was “going through”. The driver said yes. This meant he was going to complete the loop and head to town via the North side, I crossed the road and got into the front seat. My temporary companion had to wait a little longer on the other side, as he was not heading all the way back. This bus ride meant I had travelled the complete ring using the buses. With a stop on the way up, it cost only 10 EC$. It would have been less without the stop. I could not see much as it was now dark, but the driver pointed out a few highlights, including his mother’s house in Saddlers, where he stopped briefly to speak to a family member. He also mentioned Molineux, about half a mile off the road, so just lights in the distance, and I managed to spot the Ottley’s ground again as we went past. The terminus was conveniently a side street close to the Warner Park Stadium. Things were in full swing as I arrived at the main stadium, as the second half had just started in the first of two games for the evening. It was not actually the game I was expecting to be on. When I was at the SKNFA offices on the Thursday, I had thought to confirm the times of fixtures as shown on sites such as soccerway, 6 and 8 p.m. on Saturday, 3, 5, and 7 p.m. Sunday. I did not think to question the running order. Soccerway still has the games in the wrong order. The game I could not count saw a surprise 3-1 defeat for second placed Newtown United at the hands of Saddlers. The Warner Park complex now consists of two major stadiums, one for football, and one for cricket with a raised grass bank between them. On the football side, there is a bit of concrete terracing on this bank. It looks as if it has been there for a long while, but that is deceptive. The bank was not there at the beginning of the century. 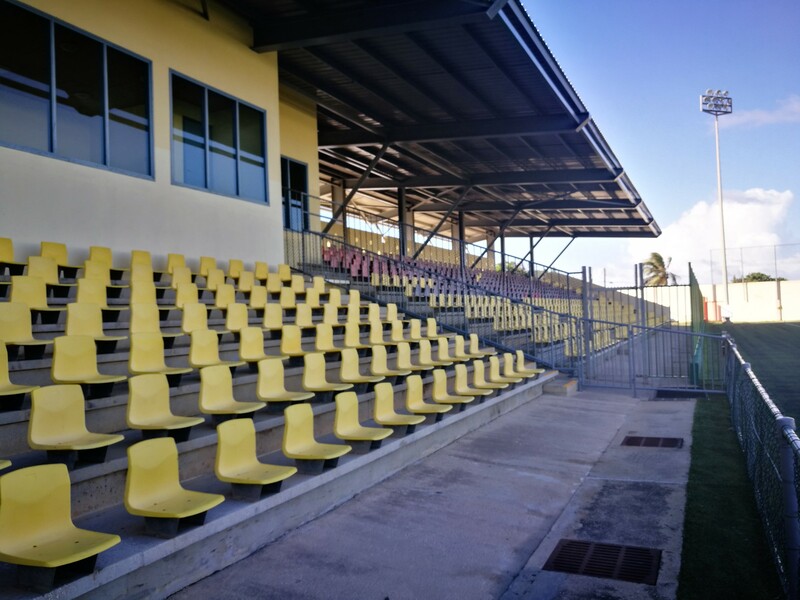 The football ground also boasts a very good main stand and a few rows of concrete seats behind one goal. The far end is open, with just a wire fence, while that end of the grass bank is not concreted. The cricket grounds have large and modern stands on the South side, and a smaller pavilion opposite. All of these are recent additions, basically for the 2007 Cricket World Cup. This would have seen the cricket pitch moved eastward. 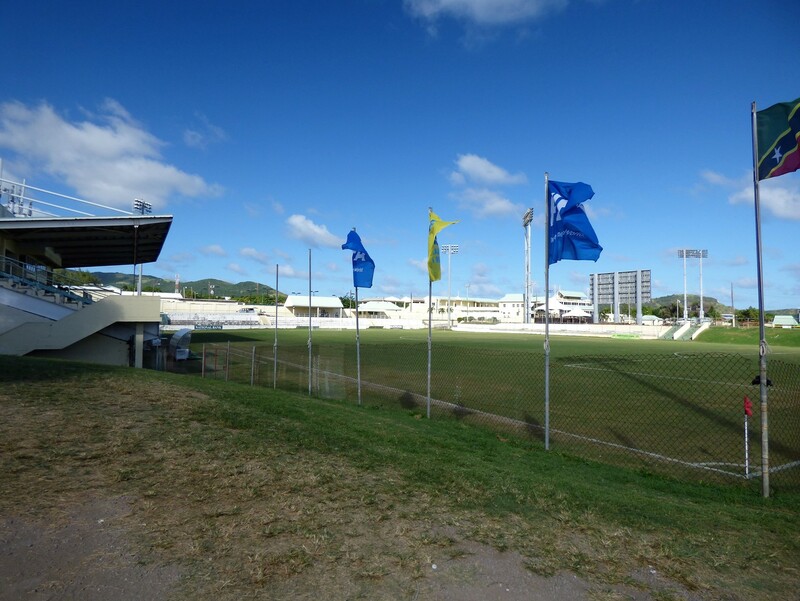 To date, Warner Park has staged 3 test matches and a number of one day and T20 internationals. England have not played in these games. Prior to that, the football facilities would have been used for cricket as well. The concrete steps behind the goal continue along to curve behind the main stand, leaving a small area of grass to one side of the stand with no apparent use. This, I feel is a sign of an earlier reconfiguration before the stand was built. The stand still appears to be a relatively older feature. It concrete features date it back around 50 years. It is basic, but easily fit for purpose. With individual plastic seats for most of its area, it now seats less than 1000, but probably could have held twice this in the past. The entrance ways are at the top, where there is space to stand behind the seats and two serveries for food and drink, one on each side. A couple of media boxes and a open plan area which could be used for hospitality sit centrally at the top. The public area below is utilitarian and featureless, with nothing except toilets and a gangway. Even lower levels are accessed from outside or the grass area to the side, and certainly include the dressing rooms, plus I assume other facilities as required for international football. There is another bar and eatery at the far end of the terrace behind the goal. Like the stand, this has its pathway above the steps and seats, and this is the favoured location for those that do not want to sit. A couple of mobile concessions sell popcorn, sweets and drinks here as well. The pitch was in fairly good condition. It is a grass pitch which appears to get regular maintenance along with the cricket pitches next door. The grass had been cut so short that it appeared to have been manicured rather than mowed. There were worn patches, but considering that in a typical week it can stage five league games at the weekend and three or four midweek games in the Ladies’ League, and that there were heavy (but short) showers on a daily basis, it really did look good. 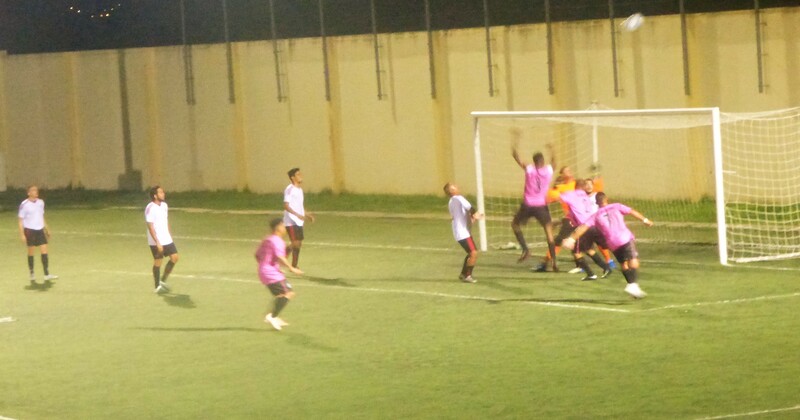 The Saturday night game was between current league champions and leaders Village Superstars and third placed Saint Pauls United. The earlier result meant that Village had not dropped a place temporarily. I was pleasantly surprised in the first half. The game was played at a good pace and was a fair degree of skill. Saint Pauls took and early lead, but a penalty goal had led to the scores being level at the break. The second half was a disappointment by comparison. It appeared that the players did not all have enough fitness to keep up the pace over the full ninety minutes. I talked a little to a member of the national team coaching selection, and managed to blag a lift back to the hotel. 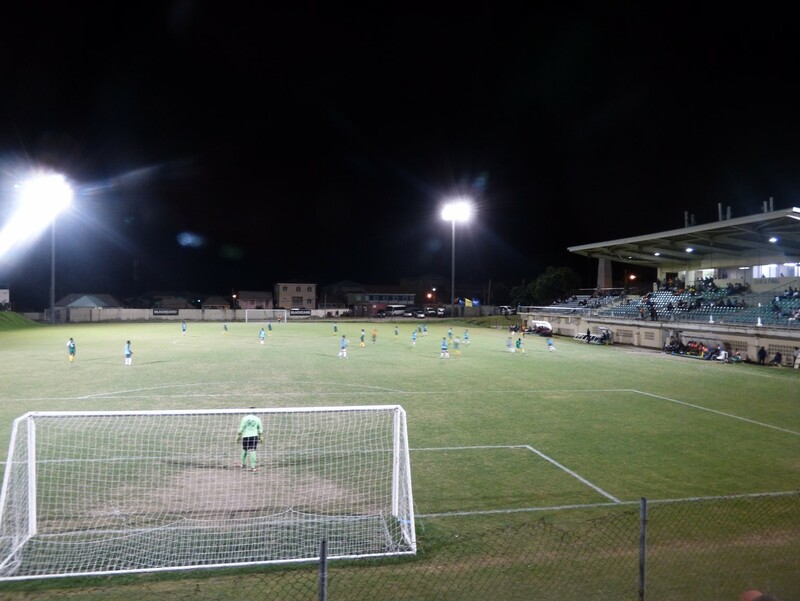 The Saint Kitts national team merges together local players and some from England, including Omari Sterling-James, a former Cheltenham player who is currently warming a bench for Mansfield. The starting XI for the last game also included Lois Maynard (Salford), Romaines Sawyers (Brentford), Raheem Hanley (Halifax), Theo Wharton and Harry Panayiotou (both Nuneaton), as well as two who play in Trinidad and one in the lower levels in the USA. This means they have very limited time training together. The English based players are generally born in the UK as well. They lost the last game to Canada, which damages their chances of reaching the top level when the Nations League starts for CONCACAF next autumn, but with two wins earlier including a 10-0 thrashing of Saint Martin, (French side), they have an excellent chance of reaching the Gold Cup in the summer. The draw is not so kind however, and they face a difficult trip to Suriname in order to pick up the points. The next day, I have no less than three matches at the stadium. First up is St Peters and Mantab. Both teams sit one point above United Old Road Jets who are bottom. The locals are not turning up in their droves and just before kick-off, I can count only around 15 people in the stadium. The number quickly doubles, as a few more come in early in the game. I think it had doubled again before half time (around 60), and more than double that at the end. Again, the best football is in the first half and it is 1-1 at the break, but a late penalty gives all the points to Mantab. Second up is Garden Hotspurs, against United Old Road Jets. This time I think it may be a thrashing as Hotspurs are two up in eight minutes. 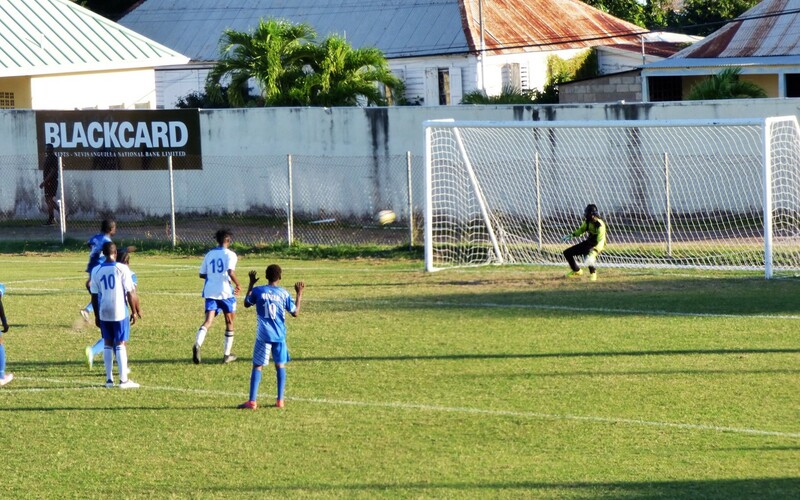 The first goal is a penalty, and the second passed in by national team player Kennedy Isles. Good to see a player called Steve Archibald player for Hotspurs, although he did not look anything like the Scotsman, I had seen playing in the FA Cup final for Hotspur many years ago. The final game was Conaree and Cayon, or SOL I.A.S Conaree against Flow 4G Cayon Rockets as the official titles put it. These are neighbouring villages on the North Coast, and of course this was a repeat of the final series I mentioned before. 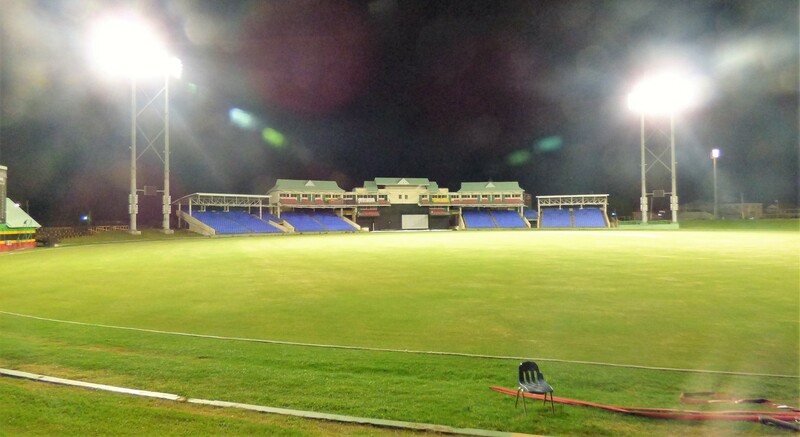 As Cayon have a decent venue of their own, rather than the basic field of the games I had seen, this is the type of game that could be easily moved from Warner Park. 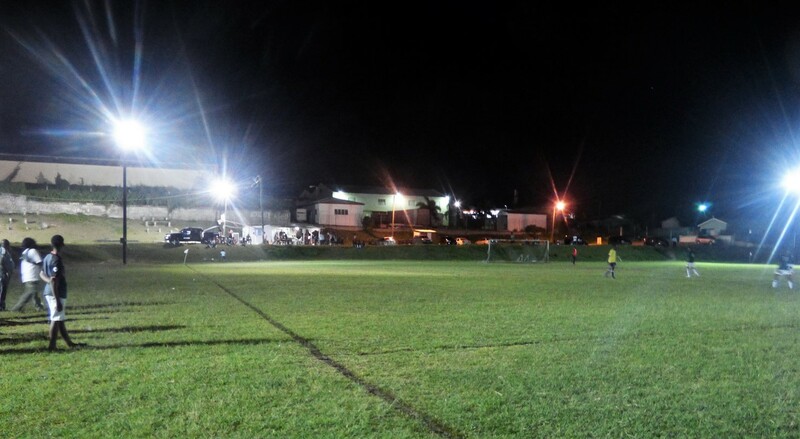 The venue was actually in use on the Monday evening for a reserve league game. You are currently browsing the Football Shaped blog archives for December, 2018.